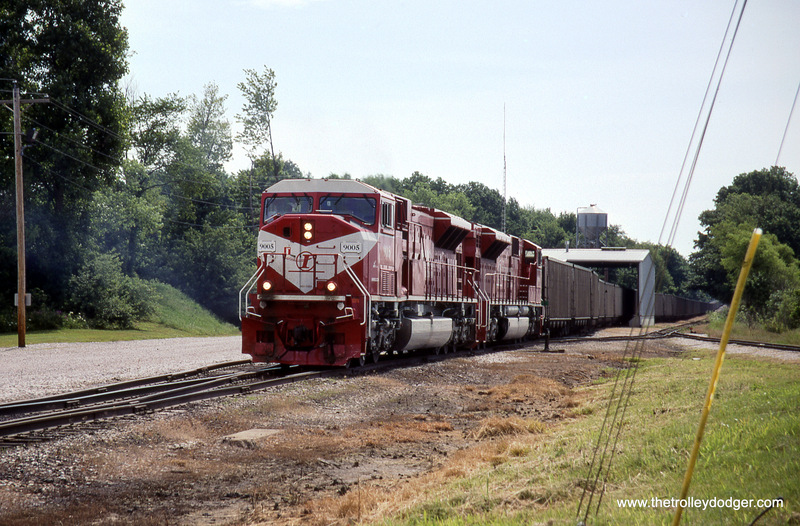 A modern EMU carries passengers on the CSS&SB while a vintage steeple cab hauls freight on the Iowa Traction. The demise of America’s electric railways, its interurban and trolley lines, was swift and merciless. What the financial hardships of the Great Depression didn’t destroy, the automobile finished off by the end of the 1960s. All that remains of some of these railways, if anything remains, is a bike trail on the right of way, some preserved equipment, photographs, or sound recordings on record albums. In some cases, however, rail service managed to continue, where a few freight customers remained the railroad could survive on a starvation diet. Abandoning all but a few miles of track, deactivation of the electric traction system, and the use of diesel locomotives kept the railroad from completely disappearing. 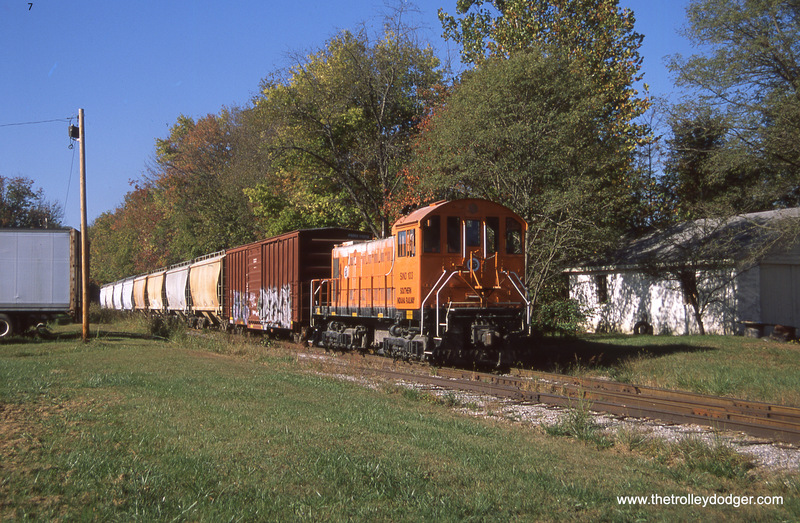 This, with the exception of the South Shore Line for passengers and Iowa Traction for freight, is how most of the common carrier remnants of the age of electric railways look today. 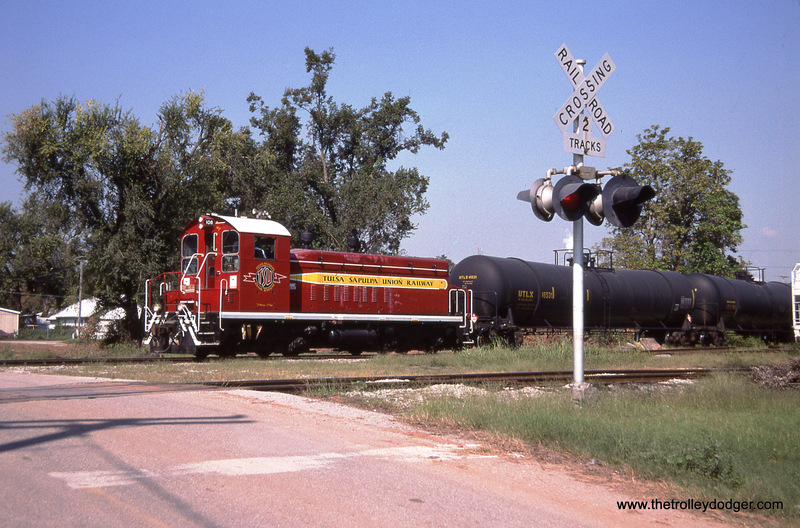 In my railfan travels I have made an effort to seek out and photograph these survivors. While I haven’t gotten every one on my list I did visit a few and I’d like to share to the photos. 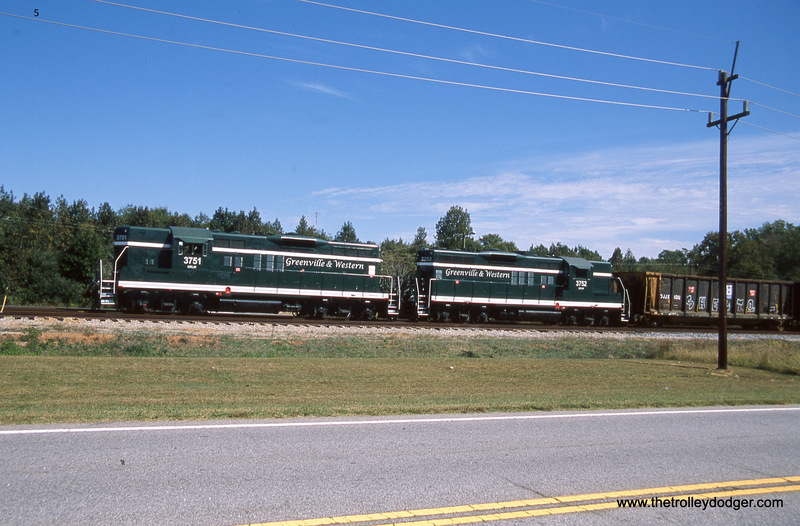 In some cases I was only able to get a few locomotive roster shots but other times, I was lucky enough to find a moving train and follow to various places along the line. I also photographed railroads that were never part of an electric railway but, coincidentally or not, share their corporate title with some long gone traction company. I included these photos as well. I have cobbled together (mostly from Wikipedia) a brief history of each the railways. 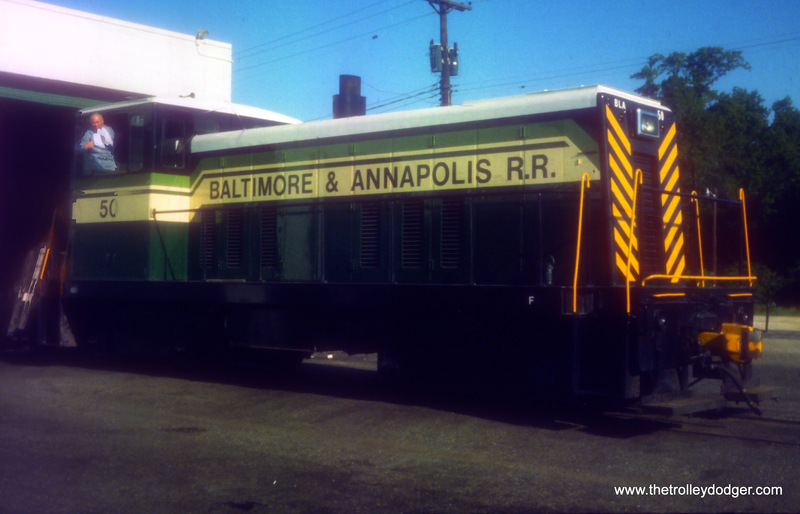 The Baltimore & Annapolis Railroad ran between Annapolis and Clifford Maryland. 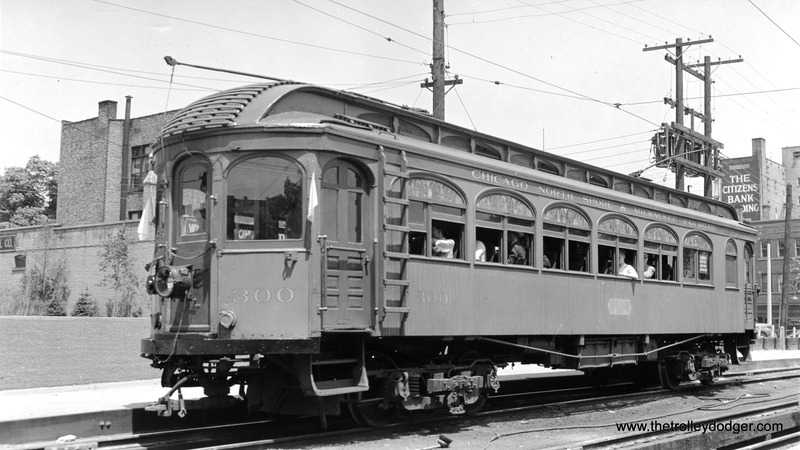 B&A electric passenger operation between the two cities continued until 1950, at which time the rail line became solely a freight carrier, operating buses for passenger service. Freight service to Annapolis continued until June 1968 when the Severn River Trestle was declared unsafe. In the 1980s the line was completely shut down. The right of way now serves as part of the Baltimore light rail system and as the Baltimore & Annapolis Trail. 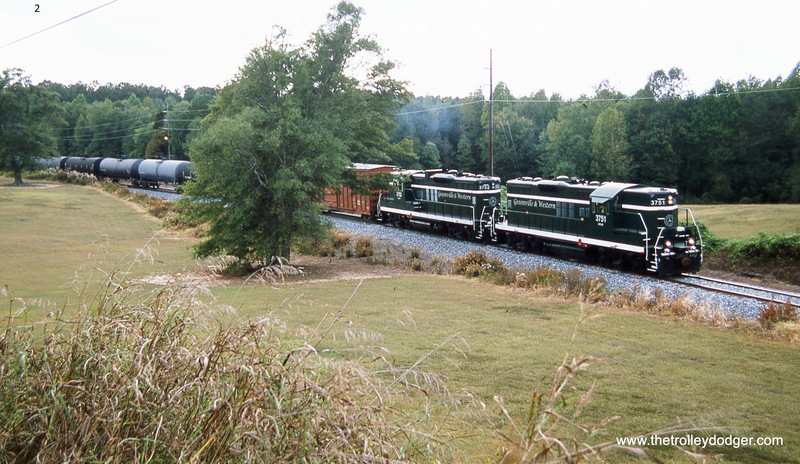 I happened to stumble upon Baltimore & Annapolis SW-9 87 while railfanning the Carolina Southern RR at Chadbourn, NC. This locomotive was built by EMD in 1953. June 22, 1998. 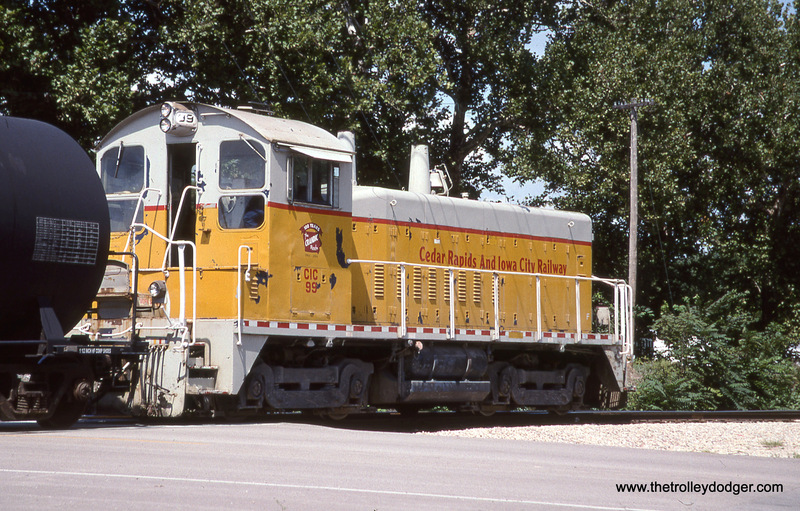 The Cedar Rapids and Iowa City Railway is also known as the Crandic. 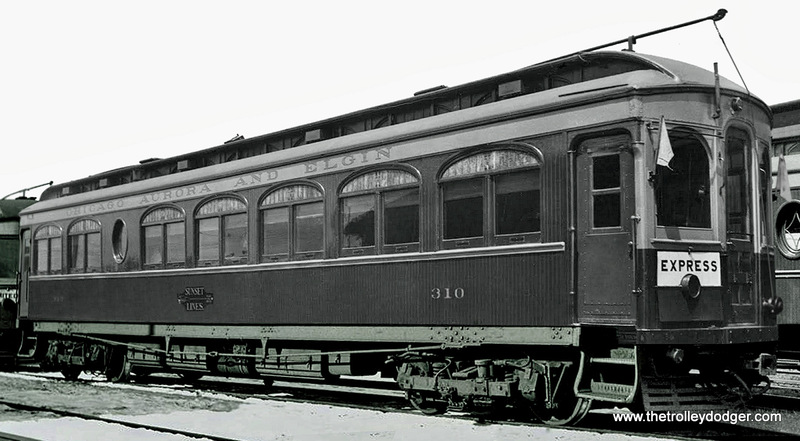 The Crandic began operations in 1904, providing interurban service between Cedar Rapids and Iowa City, Iowa. While freight was important to the Crandic in the early years, it was better known for its passenger interurban operations. 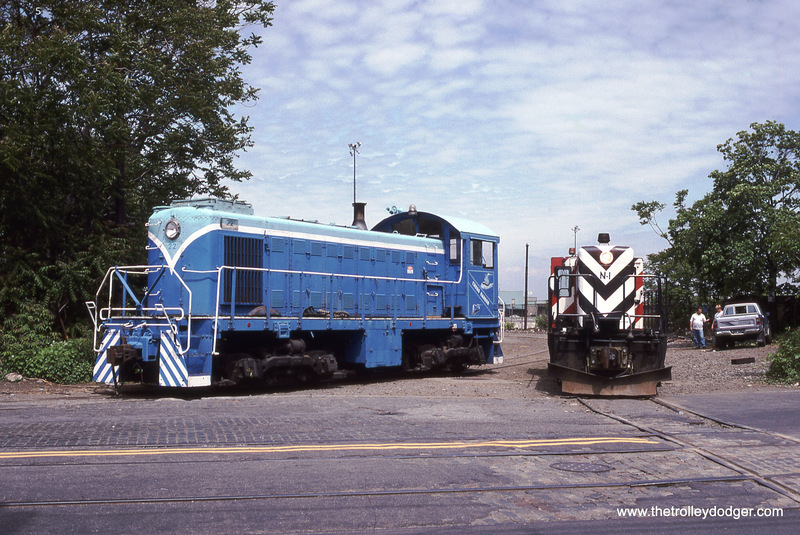 After passenger operations were discontinued in 1953, freight became the primary source of traffic for the Crandic. 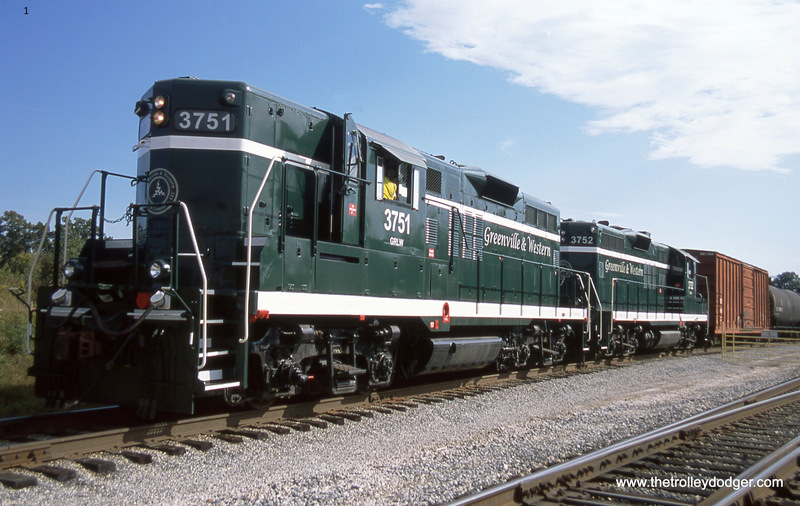 At the same time, the electric-powered locomotives were replaced with diesel models. 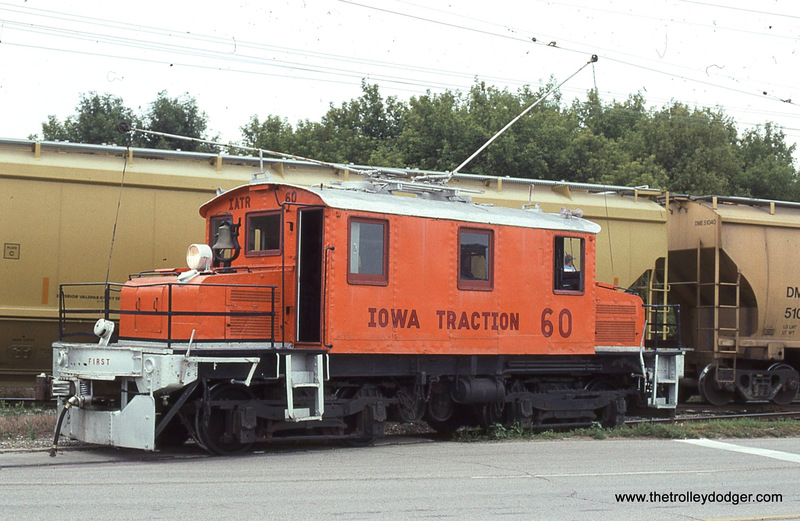 In August of 2006 while on my way to Mason City, IA to photograph Iowa Traction, I stopped off to see what I could find in Cedar Rapids. 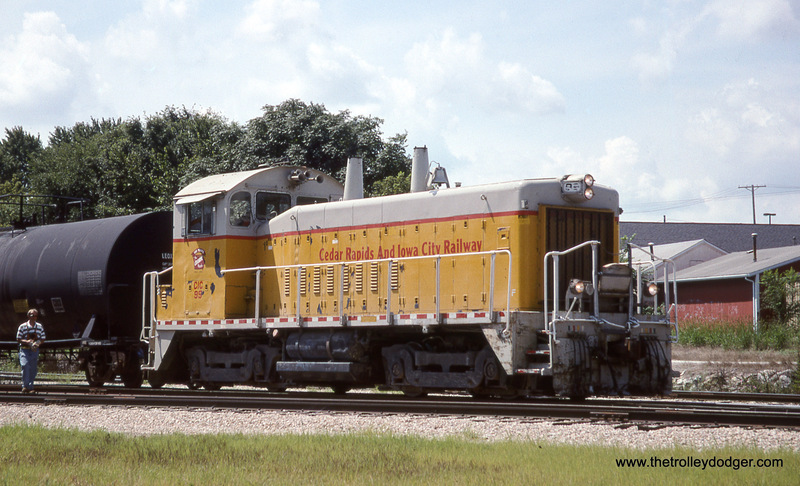 Near 8th Avenue SW I spotted Cedar Rapids & Iowa City SW-900 #99 switching the ADM plant. 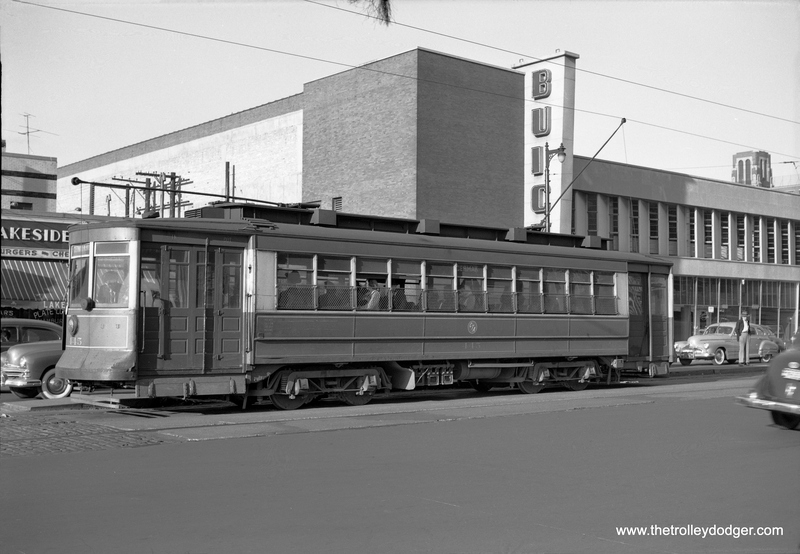 Chicago South Shore and South Bend Railroad, America’s last interurban, began in 1901 as the Chicago & Indiana airline railroad, a streetcar route between East Chicago and Indiana Harbor. By 1908 its route had reached South Bend via Michigan City. The company leased the Kensington & Eastern Railroad (an Illinois Central subsidiary) to gain access to Chicago. 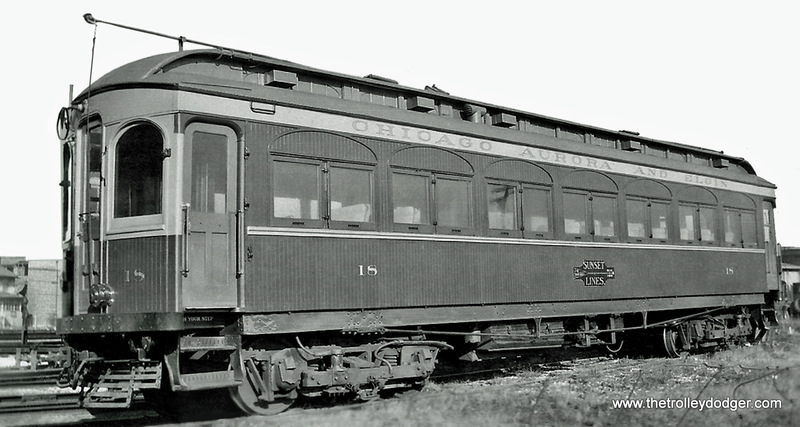 Passenger service between South Bend and Chicago began in 1909. The Lake Shore added freight service in 1916. It was renamed the Chicago South Shore and South Bend Railroad in 1925 when Samuel Insull acquired it. 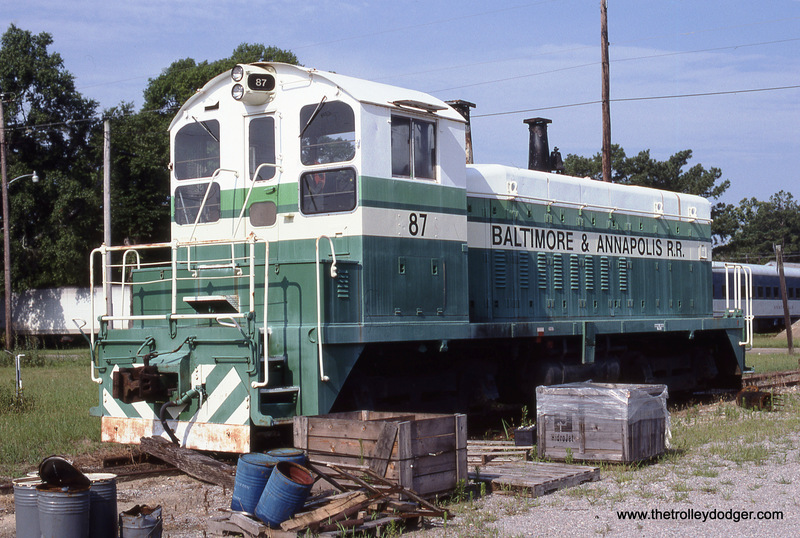 The post-World War II decline in traffic hurt the company, and it was bought by the Chesapeake & Ohio Railway in 1967. 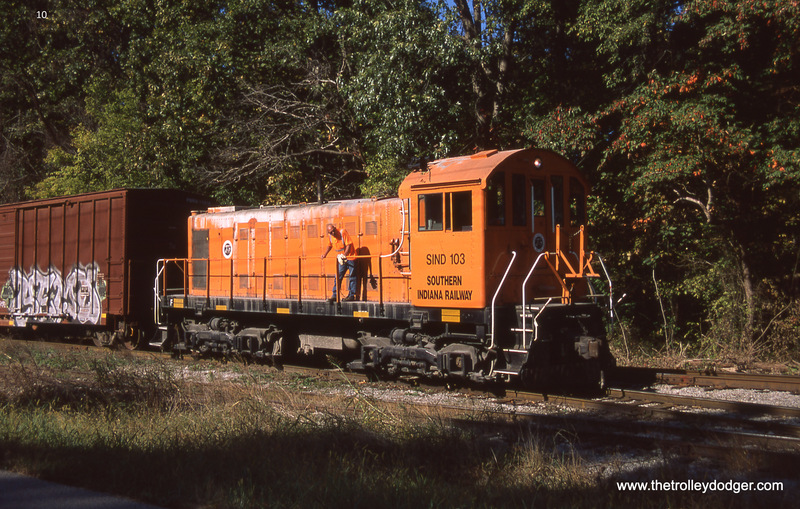 In 1977 the Northern Indiana Commuter Transportation District (NICTD) began subsidizing the passenger operations and in 1984 the Venango River Corporation (VRC) purchased the South Shore from the C&O. Venango declared bankruptcy in 1989. 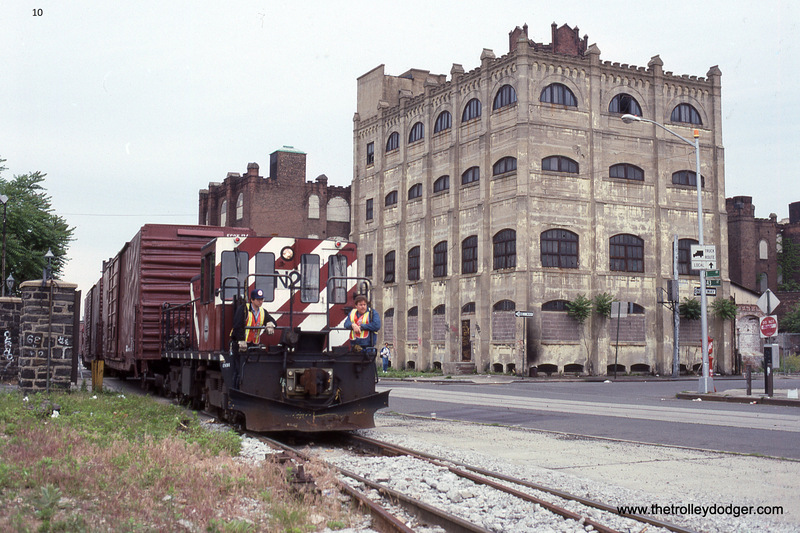 In 1990 Anacostia & Pacific Company acquired the South Shore. The NICTD purchased the passenger assets. Because the freight and passenger operations of this railroad are conducted (pun intended) by different entities, I think it is not off topic to include it on my list of former electric railway. after all, the freight trains are diesel powered. 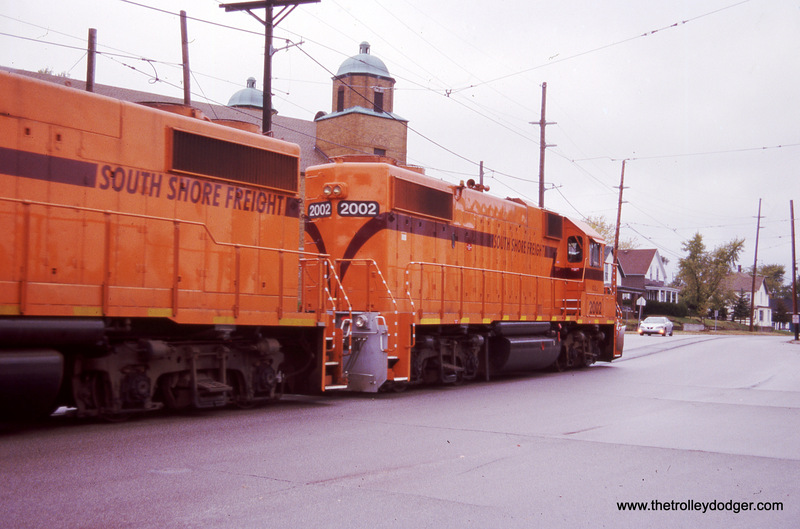 South Shore Freight GP38-2s 2002/2007 running lite on 11th Street in Michigan City IN on a rainy October 15, 2009. 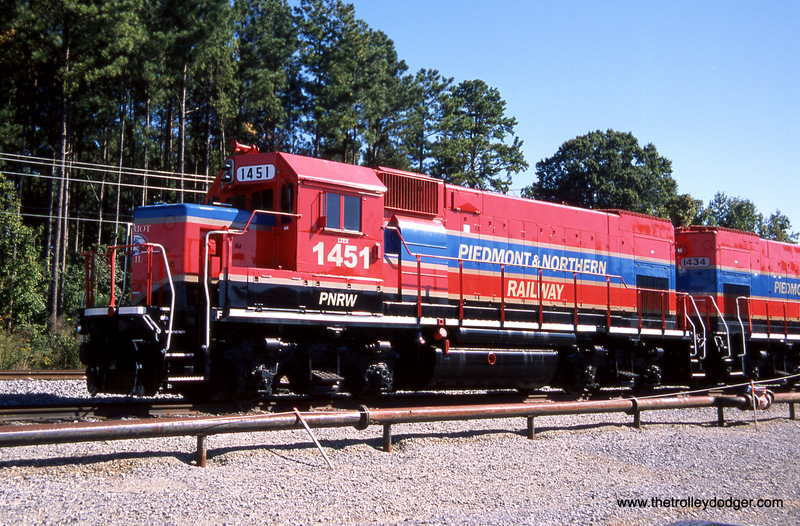 The Piedmont & Northern Railway was a heavy electric interurban company operating over two disconnected divisions in North and South Carolina. Unlike similar interurban systems the Piedmont & Northern survived the great depression and was later absorbed into the Seaboard Coast line in 1969 and eventually absorbed by CSX. 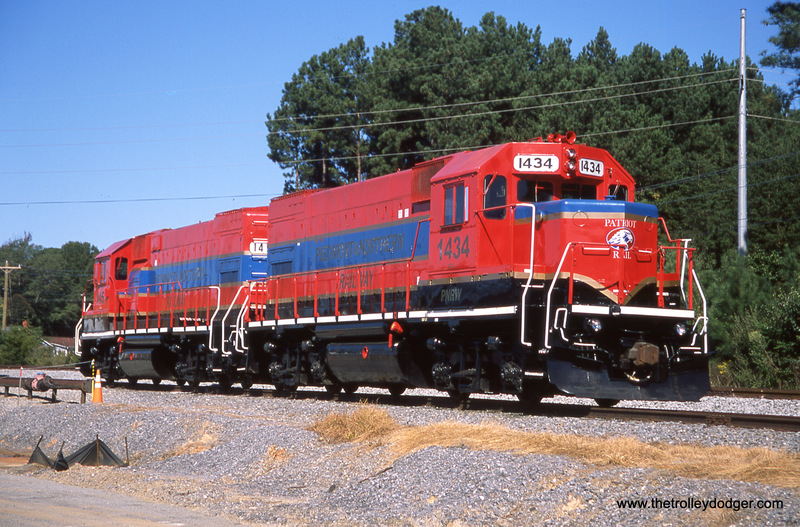 The North Carolina Department of Transportation bought 12 miles of the railroad from Mt. 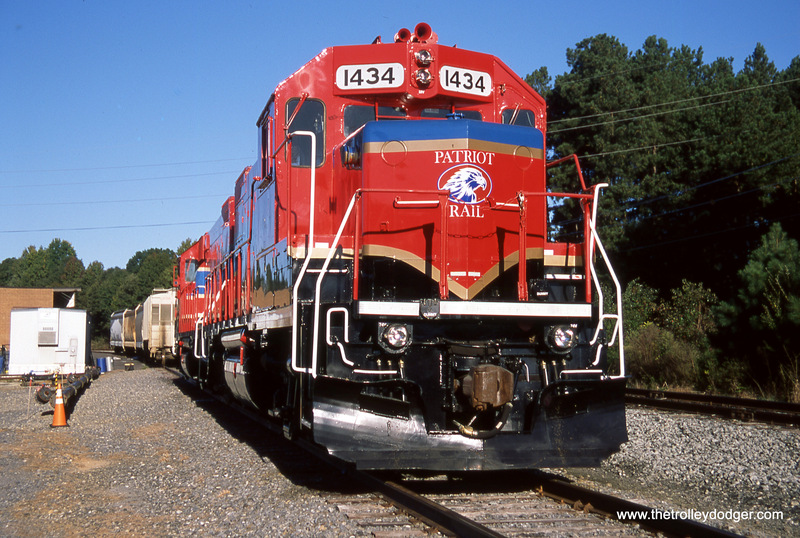 Holly, NC to Gastonia, NC in May 2010 and awarded a contract to Patriot Rail Corporation to restore the track and operate trains. 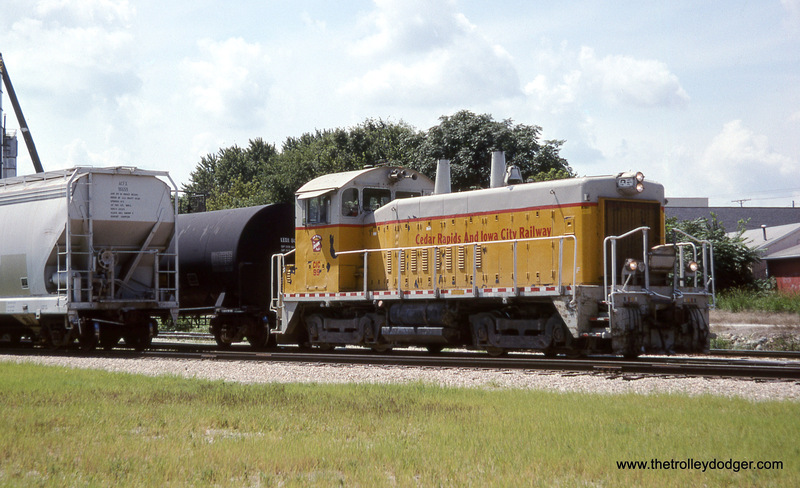 Iowa Pacific took over operation of the line on August 1, 2015. Another short line operating on Ex-P&N tracks is the Greenville & Western. 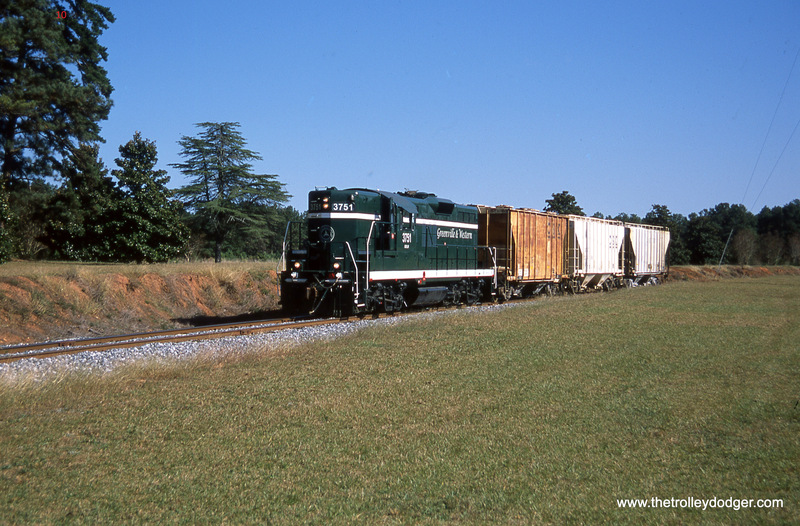 The Greenville & Western Railroad operates on twelve miles of the former Southern division of the Piedmont & Northern Railway between Pelzer and Belton, SC. 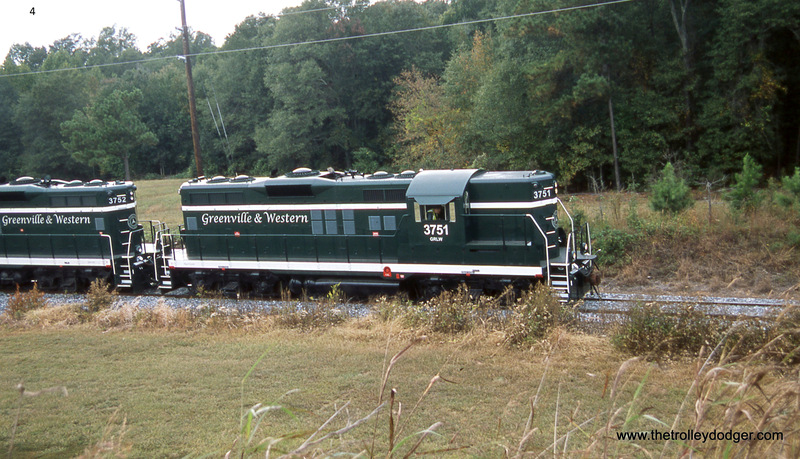 In 1910 the Greenville Spartanburg & Anderson Railway was formed to build an interurban railroad between its namesake cities. 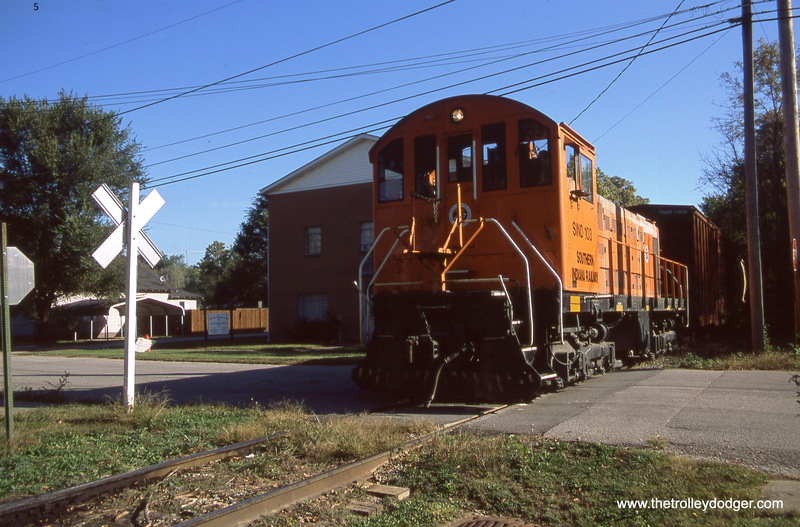 The Pelzer-Belton segment was built as part of its mainline from Greenwood to Greenville between 1910-1912. 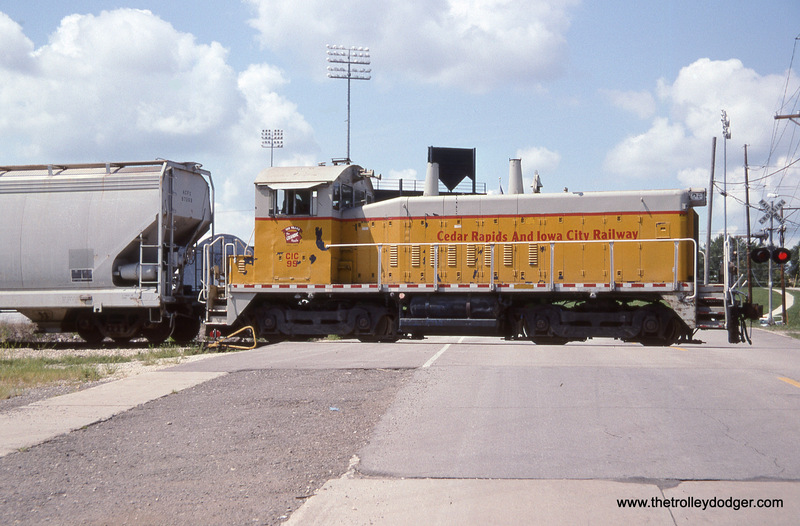 This line became part of the P&N in 1914, SCL in 1968 and CSX in 1986. 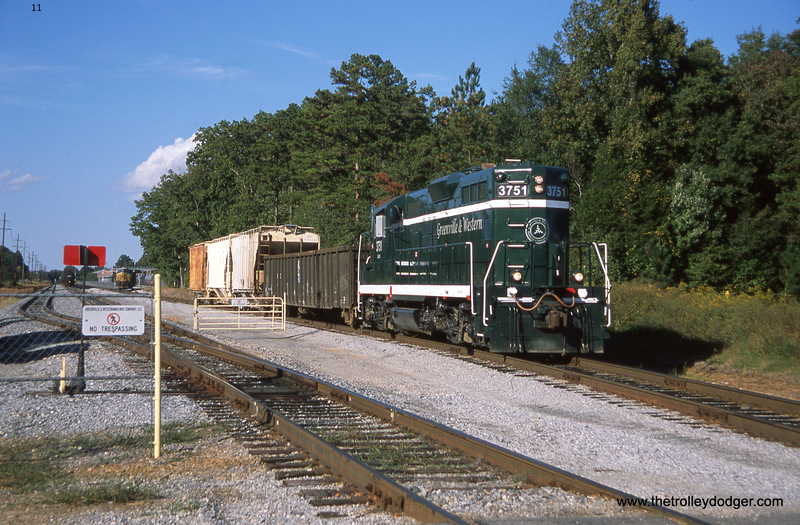 CSX sought to abandon the line from Belton to Pelzer but the abandonment was rejected by the Surface Transportation Board. 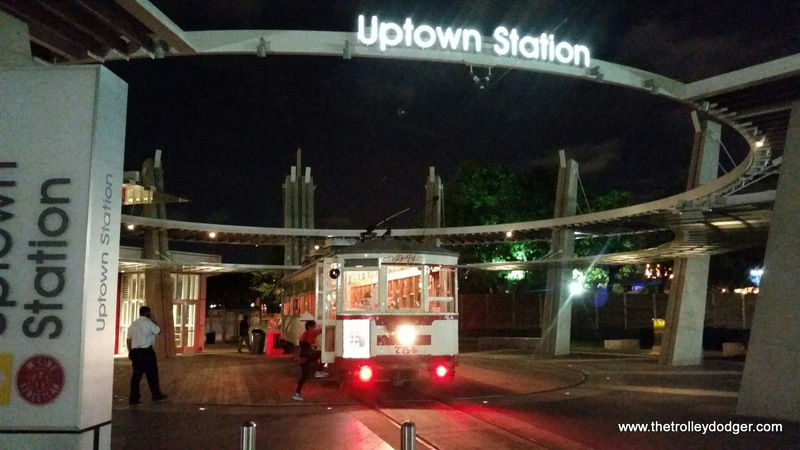 Effective October 21, 2006 GRLW assumed ownership and operation of the line. 1. 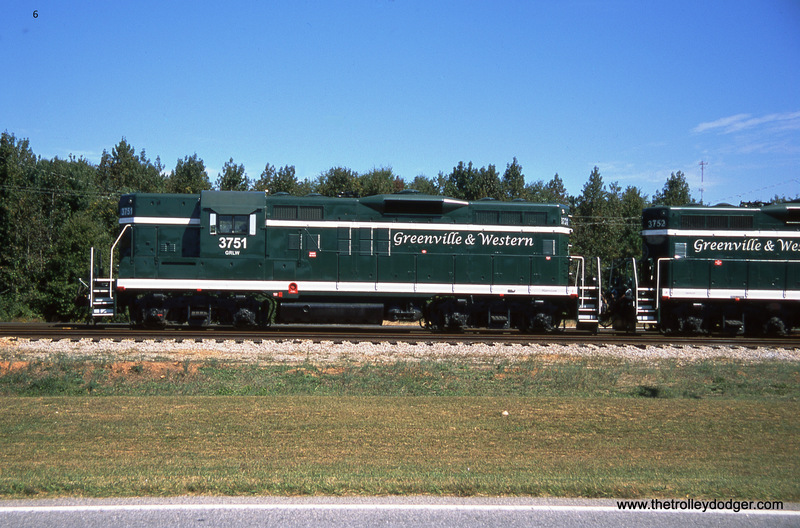 Greenville & Western GP-9s # 3751 & 3752 about to depart the ethanol plant at Cheddar and head to the CSX interchange at Pelzer, SC. 2, 3, & 4. 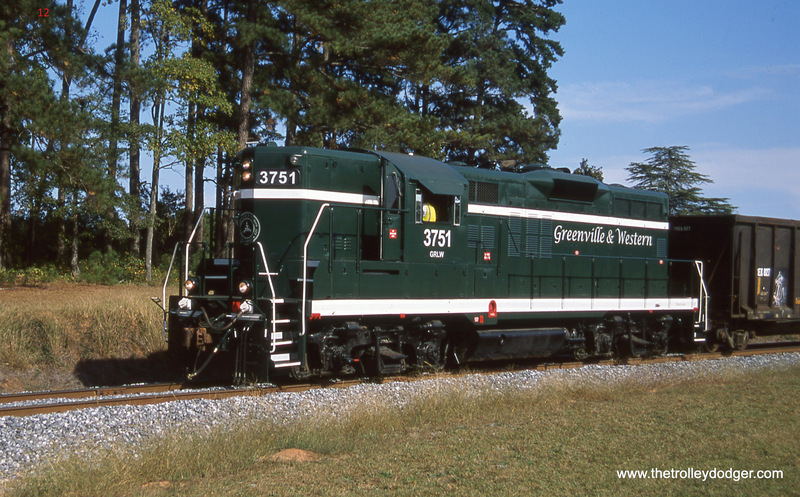 Greenville & Western GP-9s # 3751 & 3752 power an ethanol train at Williamston, SC. October 8, 2014. 5. Not much of the Ex-P&N’s interurban past is evident today but at Belton, SC there is some side of the road running that harkens to the past. GRLW GP-9s are in the yard waiting for the next trip out. 6 & 7. 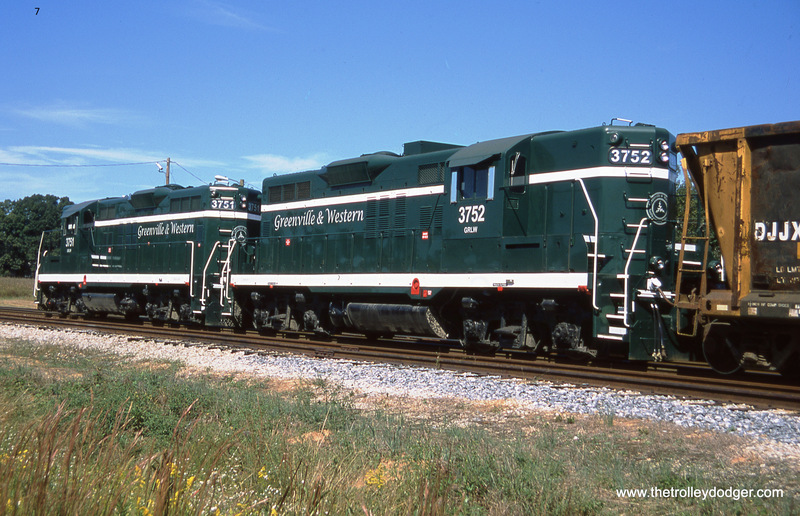 Greenville & Western GP-9s # 3751 & 3752 at Belton. 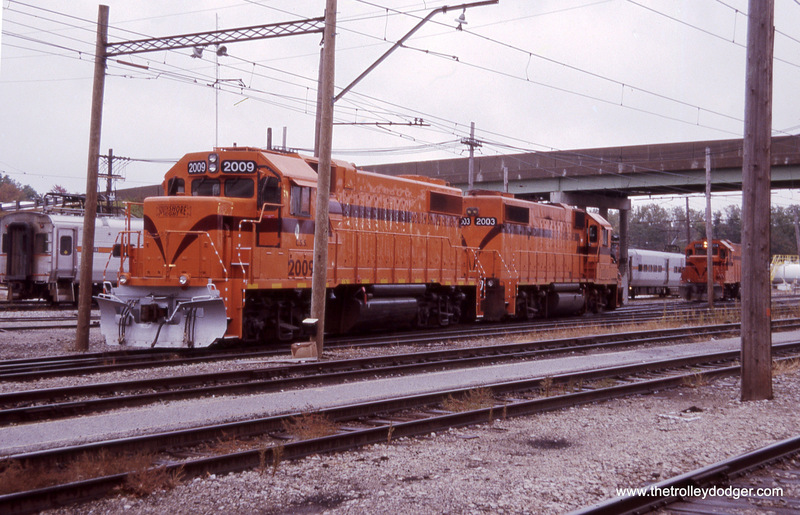 Both units are ex-B&O and look grand in GRLW’s classy paint scheme. 8. 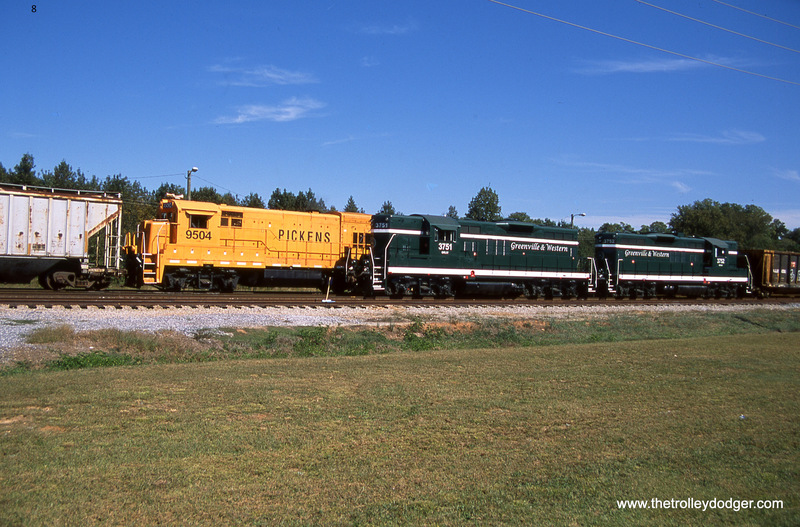 The Greenville & Western interchanges with the Pickens RR in the Belton yard. 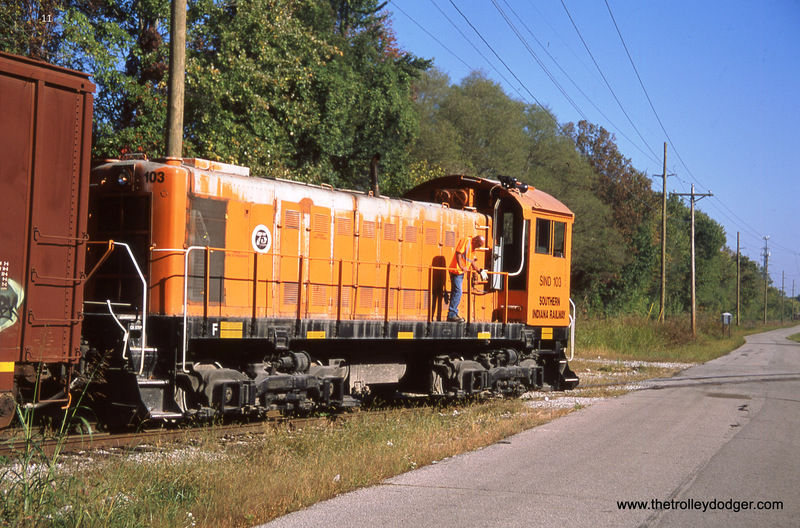 Here Pickens U18B # 9504 delivers a cut of cars late in the afternoon of October 8, 2014. 9. 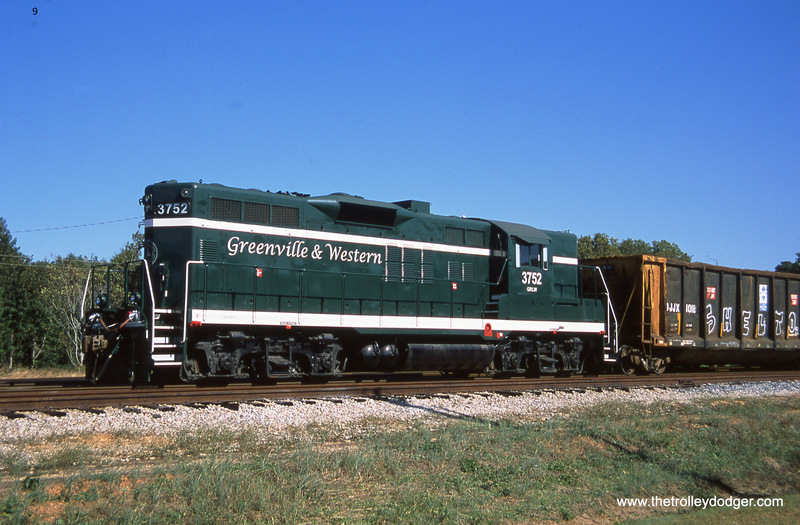 Greenville & Western GP-9 # 3752 was built by EMD in July of 1957 and is Ex-B&O # 6554. 10. Greenville & Western GP-9 # 3751 takes three cars to Cheddar as it passes through Belton. The South Brooklyn Railway started as The South Brooklyn Railroad and Terminal Company and was incorporated September 30, 1887 to build from the end of the Brooklyn Bath & West End Railroad (West End Line) at 38th Street and 9th Avenue northwest to the foot of 38th Street, and was leased to the BB&WE, allowing BB&WE trains to run to the 39th Street Ferry. 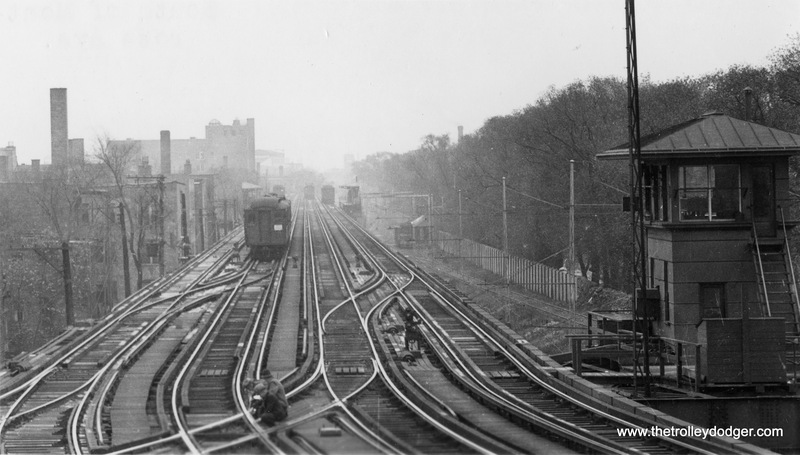 Then the Prospect Park and South Brooklyn Railroad connected the Culver Line to the South Brooklyn Railroad in 1890, and the latter was bought by the Long Island Rail Road in 1893. The LIRR obtained the South Brooklyn Railway & Terminal Company lease on the land in 1897 and used steam powered locomotives. 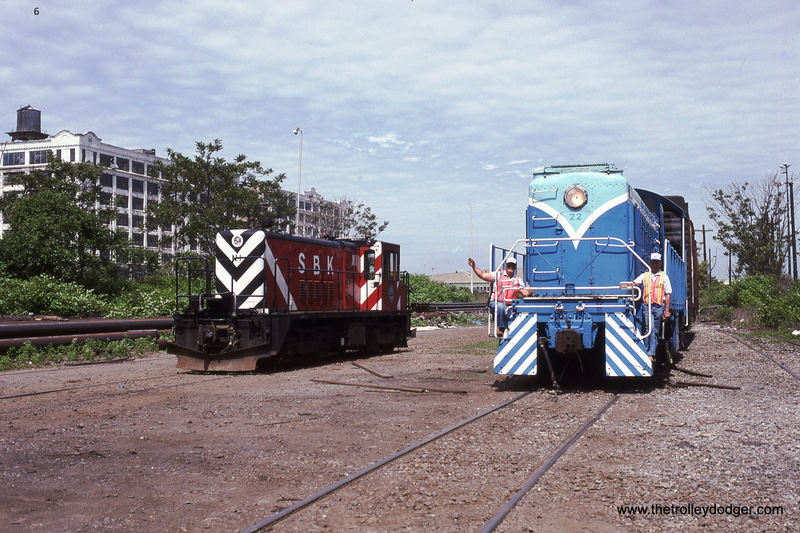 As these locomotives could not be used for freight operations, the line was electrified in 1899. 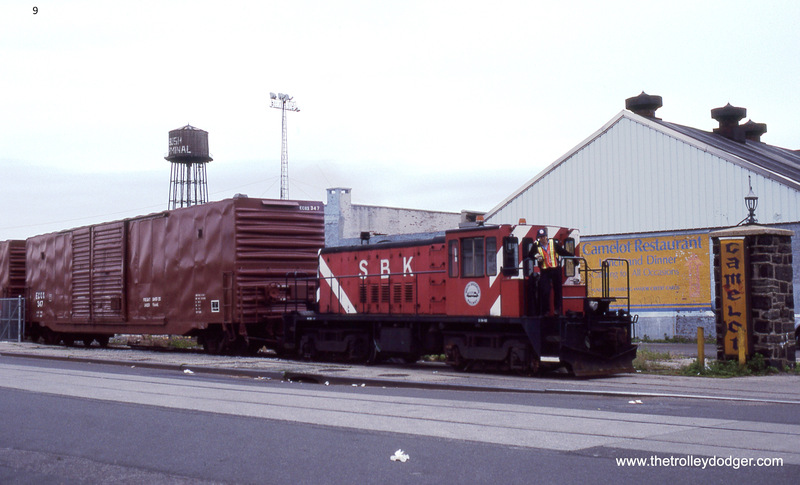 After foreclosure of the South Brooklyn Railroad & Terminal Company in December 1899, the company was reorganized as the South Brooklyn Railway on January 13, 1900. The Brooklyn Rapid Transit Company acquired the railway on August 31, 1902, but the LIRR still ran the trains until 1903 or 1905. After the cessation of LIRR operations, the BRT started passenger service and transferred freight service to a subsidiary, Brooklyn Heights Railroad, which provided freight service with three locomotives, with a fourth delivered in 1907. 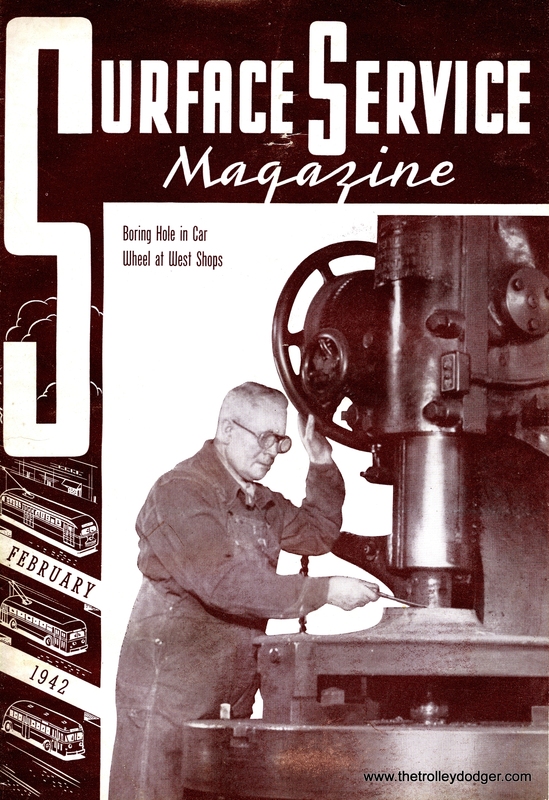 It carried mail for the United States Postal Service, as well as lumber, cement, sand, stone, ashes, pipe, marble for headstones, and granite for curbstones. 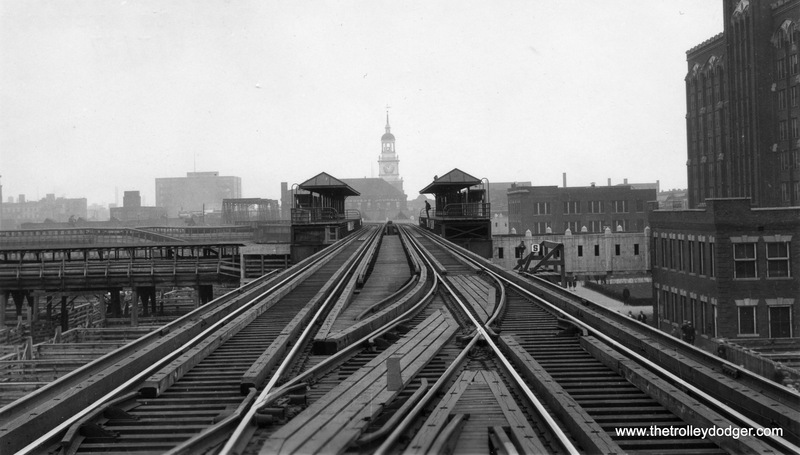 On February 28, 1907, the South Brooklyn Railway and the Brooklyn Heights Railroad were split from each other, but both were still owned by the BRT. 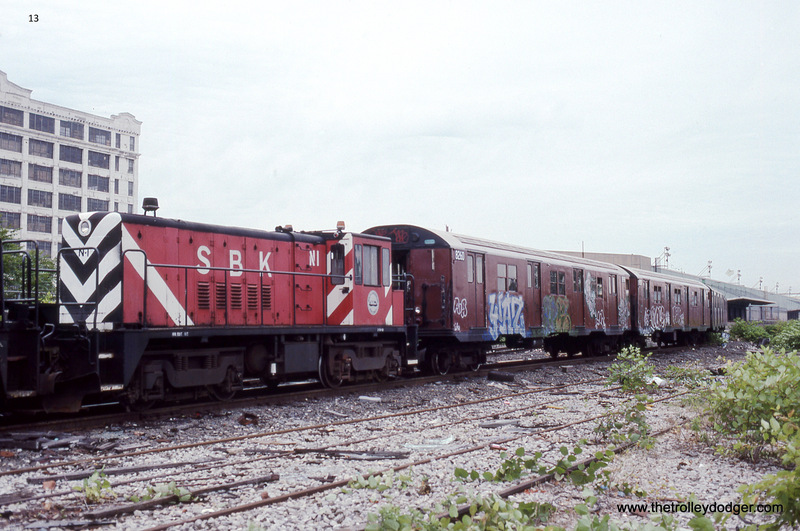 The South Brooklyn Railway was a separate subsidiary company that carried both passengers and freight. 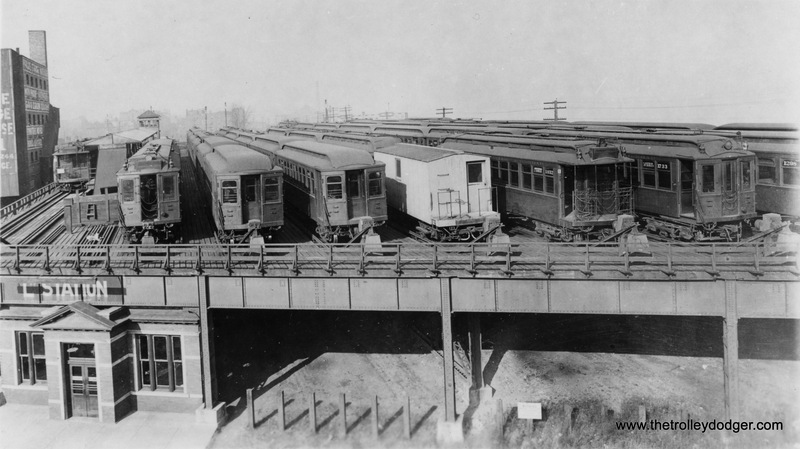 In 1913, all of the BRT’s lines were reorganized, and all ownership of freight operations was transferred to the South Brooklyn Railway. The railway, along with the other non-rapid transit properties were transferred to the New York City Board of Transportation on June 1, 1940. 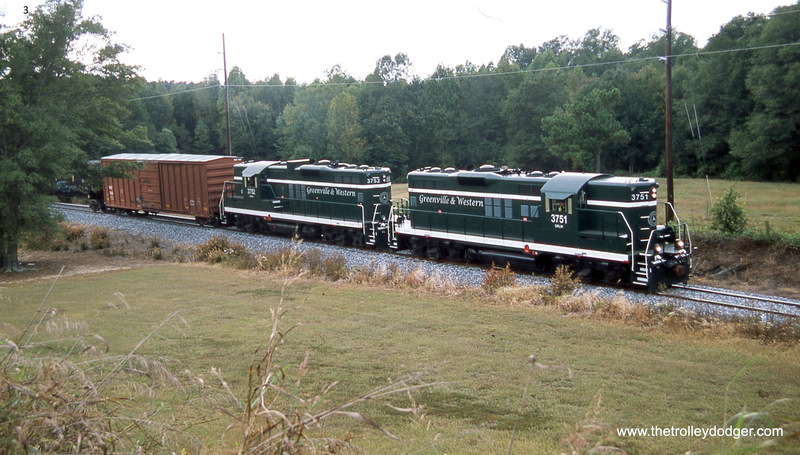 In 1946 the railway purchased two Whitcomb ex-US Army diesel locomotives. Operations were transferred to the New York City Transit Authority on June 15, 1953. 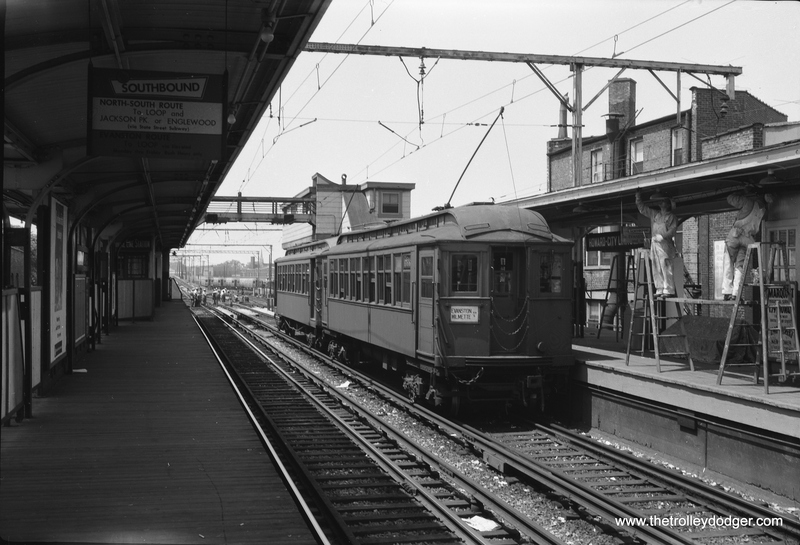 Passenger service ended on October 31, 1958, and thereafter the South Brooklyn Railway started using the surface trackage solely for freight. 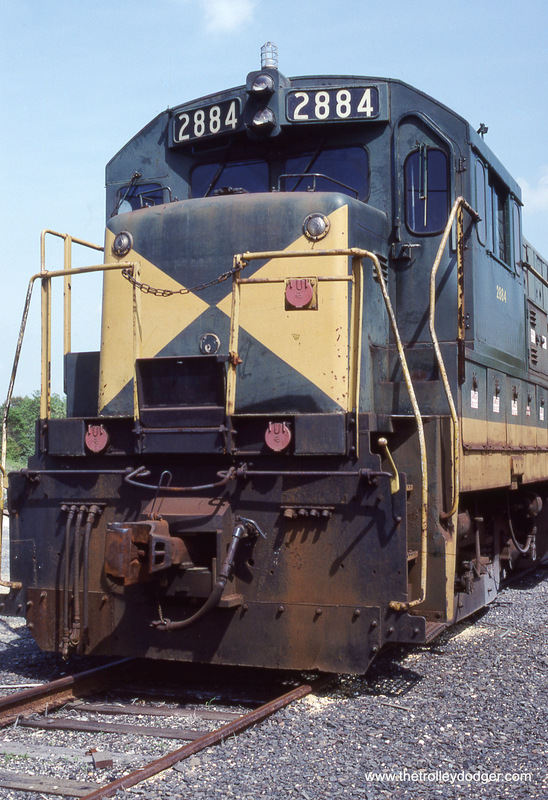 In 1960, two more diesel electric locomotives were bought. 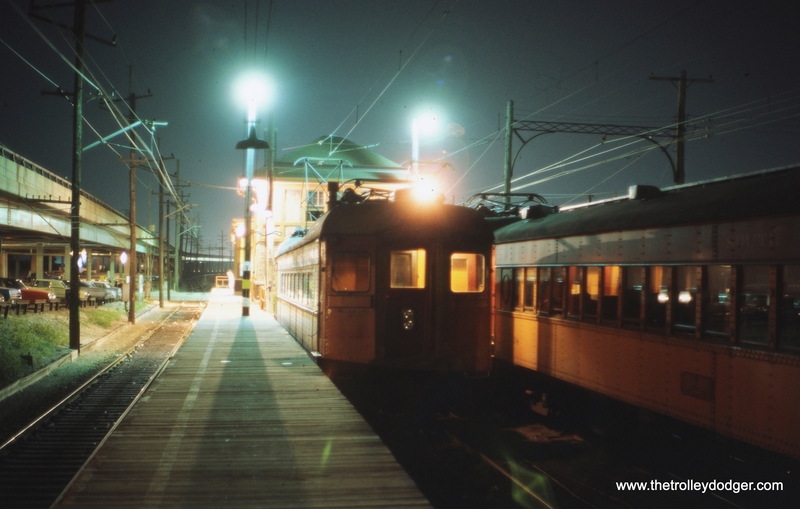 On December 27, 1961, the line was de-electrified, due to the high cost of refurbishing the overhead trolley wire. 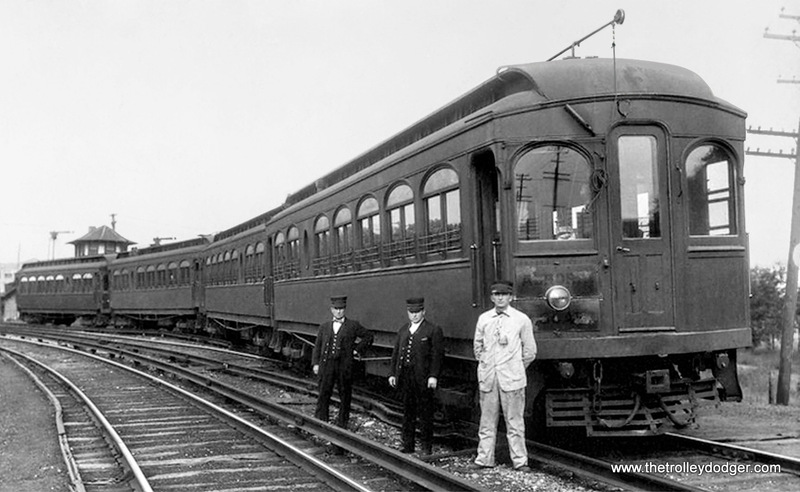 Electric locomotives #4, 5, 6, and 7, which had third rail conduction shoes, were given to the NYCTA for subway and elevated operation. 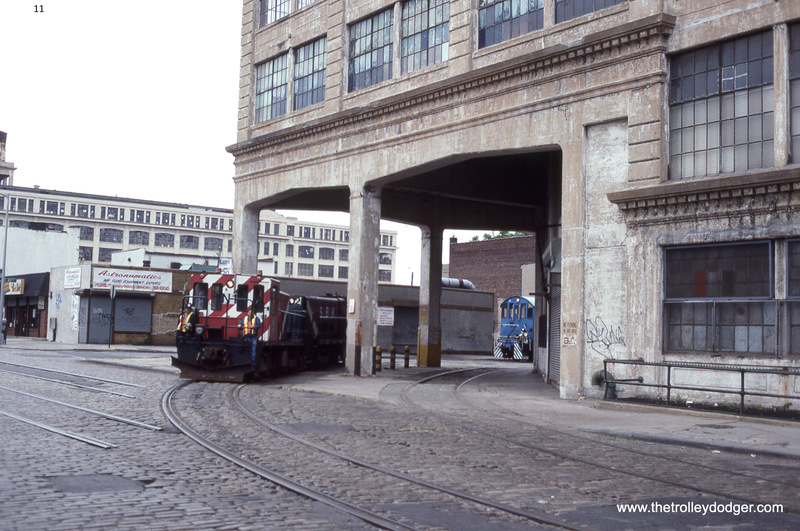 In 1994, the last non-NYCTA customer on the line closed; the South Brooklyn Railway was then used almost exclusively for subway connections to the LIRR. 1, 2, & 3 When I took these photos of the South Brooklyn Railway they still had on line freight customers that needed service. 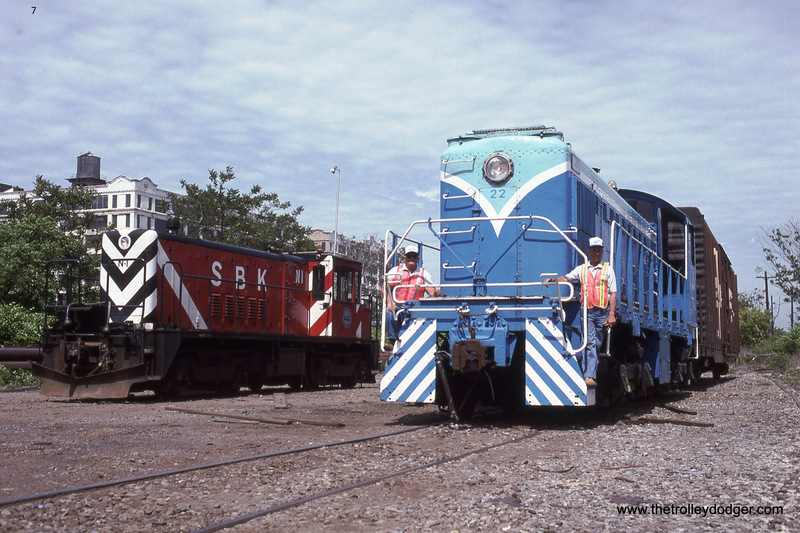 GE 50T locomotives # N2 & N1 deliver one car to the Bush interchange yard for pick up by the New York Cross Harbor RR. 4. N2 has cut away from N1 while the NYCH crew, with Alco S-1 # 22, is in the background coupling up to the lone car that SBK delivered. 5, 6, & 7. 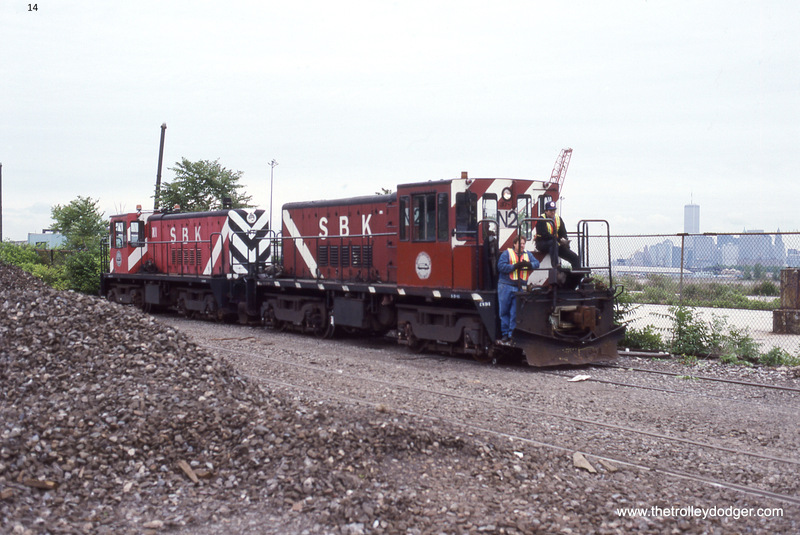 SBK GE 50T N1 and NYCH Alco S-1 # 22 are side by side at the Bush interchange yard, Bush Junction, Brooklyn, NY in May of 1992. 8. SBK GE 50T # N1 at Bush Junction in Brooklyn, NY. Note the interesting array of trackage in the pavement of 2nd Avenue. 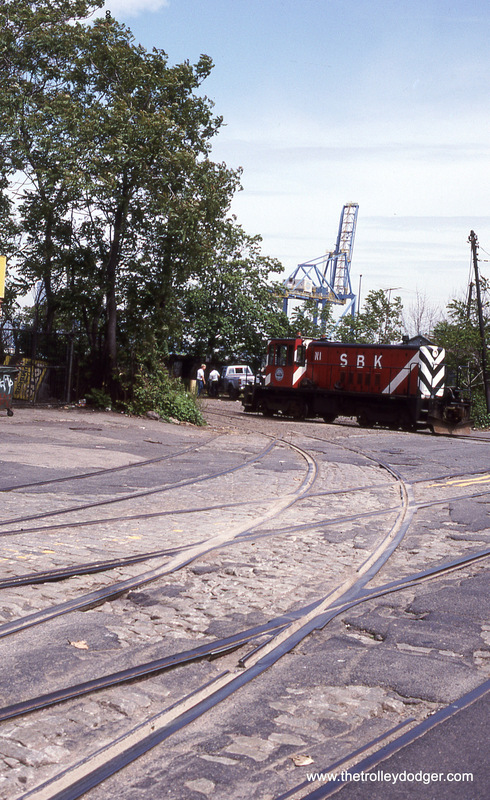 The street trackage is used by the NYCH RR to return to Bush Terminal a few blocks away. 9. 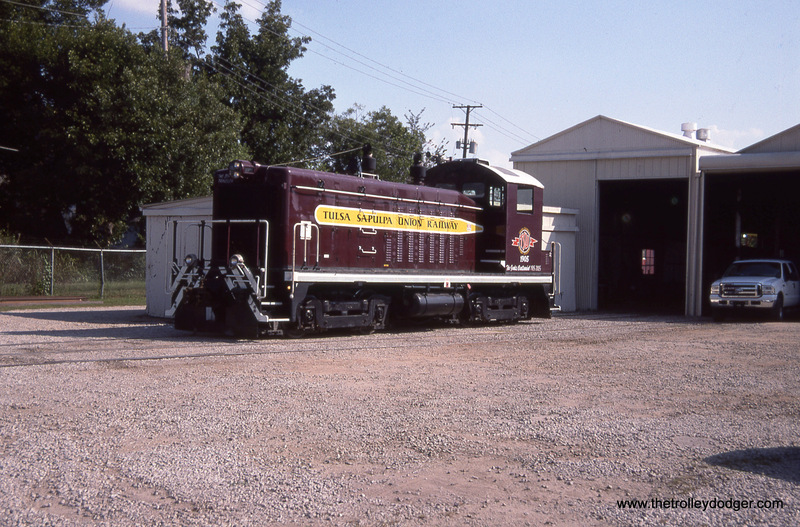 On June 5, 1993 the New York Cross Harbor RR held an open house and yard tour at Bush Terminal. 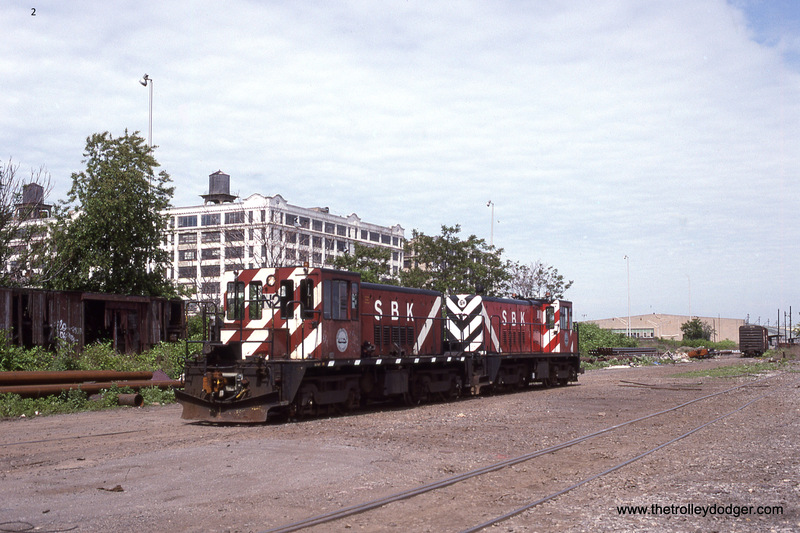 South Brooklyn 50T N1 was on hand that day and was posed with freight cars (box cars for recycling materials) at the entrance of the yard. 10. 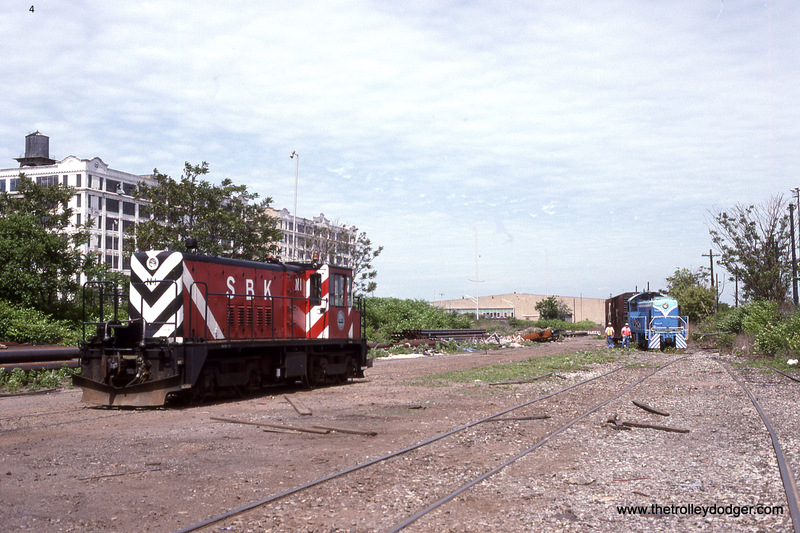 SBK 50T # N1 takes the box cars a short distance and drops them at the recycling plant. 11. SBK N1 and N2 travel lite along the street trackage heading back to home rails. On the way the tracks cut through the corner of the Bush terminal building at 41st Street & 2nd Avenue. NYCH follows behind. 12. 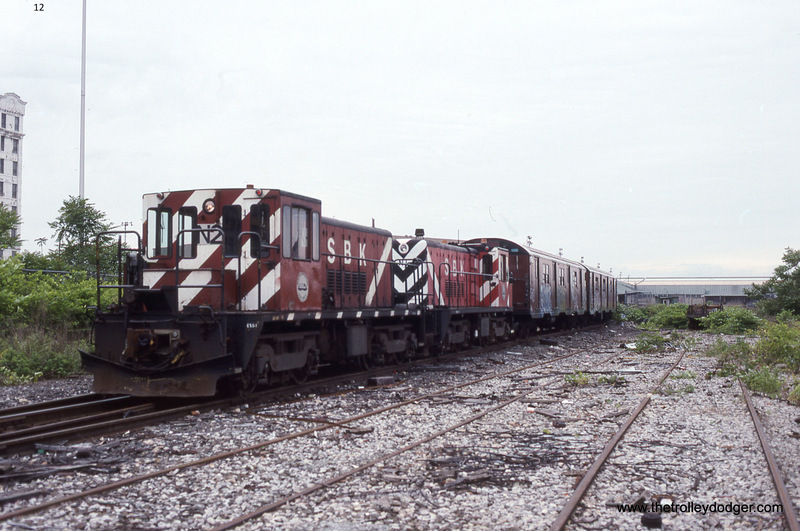 SBK 50Ts # N2 and N1 with a cut of NYCTA R30 subway cars heading for scrap. 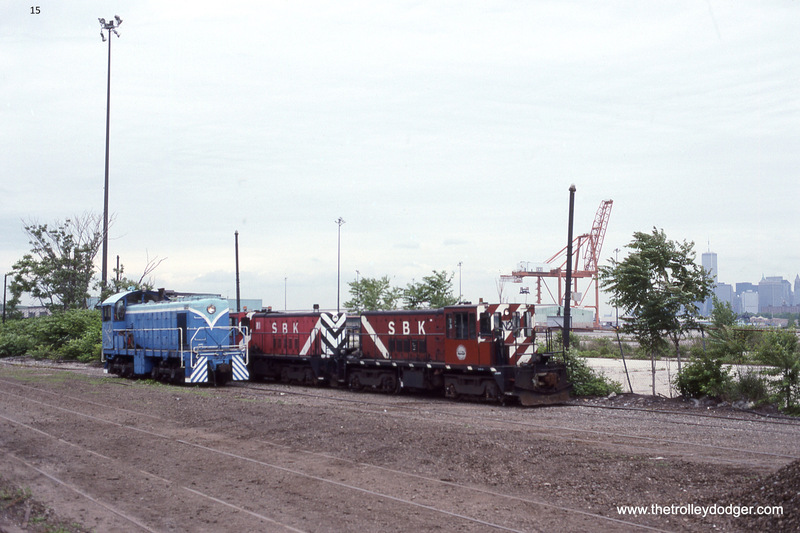 Bush interchange yard, Brooklyn NY 6-5-93. 13. 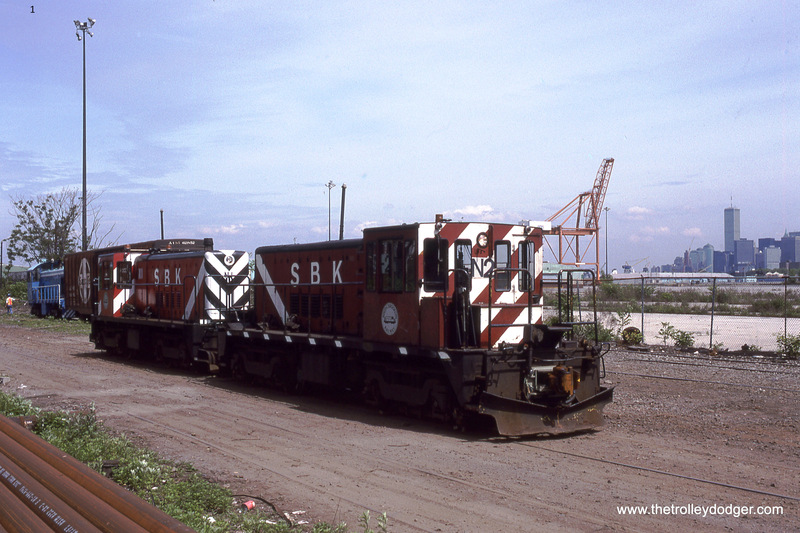 SBK 50T N1 with scrap NYCTA R30 subway cars. 14. South Brooklyn 50Ts N2 & N1 at Bush interchange yard with the Manhattan skyline in the distance. Brooklyn NY. 1, 2, 3, & 4. 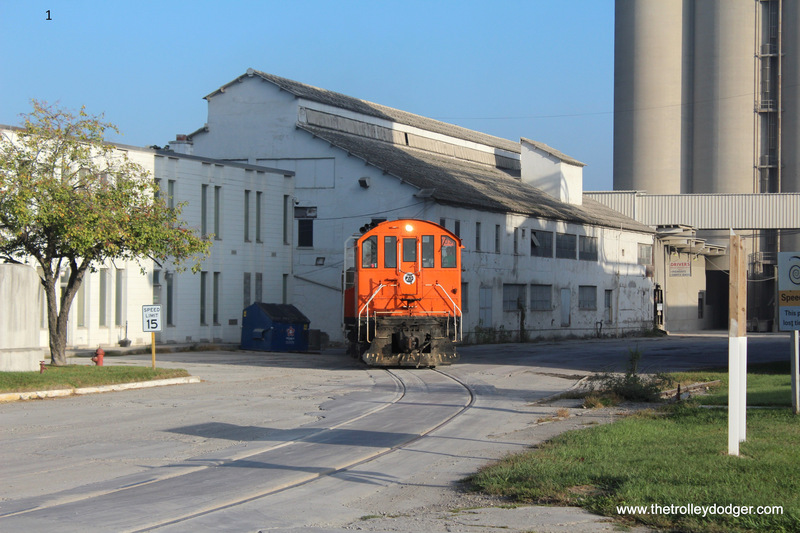 When I arrived in Speed, Indiana early on the morning of October 7, 2015 the Southern Indiana Railroad was already hard at work switching the ESSROC Cement plant. 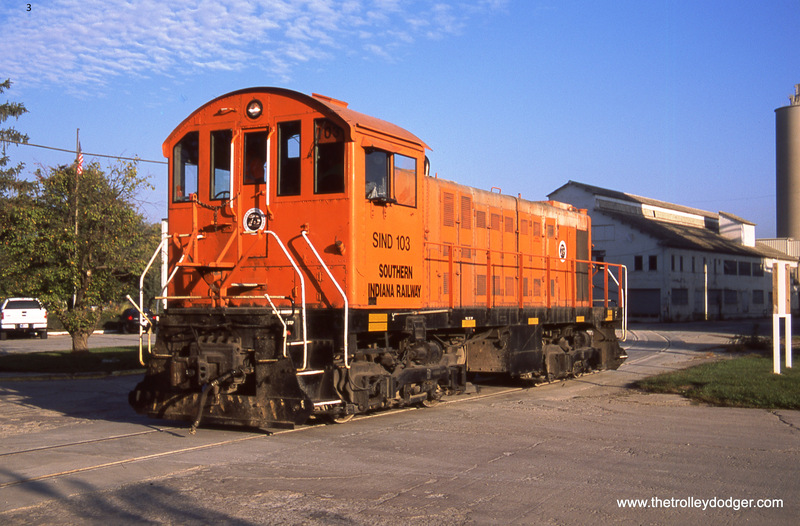 SIND S-2M # 103 (Ex-Pickens RR # 7 and was repowered by GE with a Cummins engine) is looking great in it’s traction orange paint. 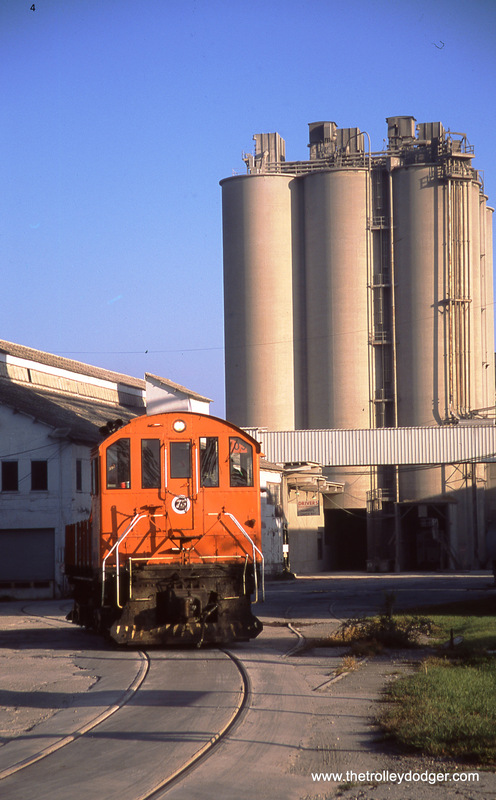 The tracks being embedded in the pavement of the cement plant’s driveway almost gives the appearance of street tracks, another nod to this railroad’s interurban past. 5. On the road…SIND S-2M # 103 is crossing Utica Street in Sellersburg. The road’s enginehouse is located here a short distance away. 7. 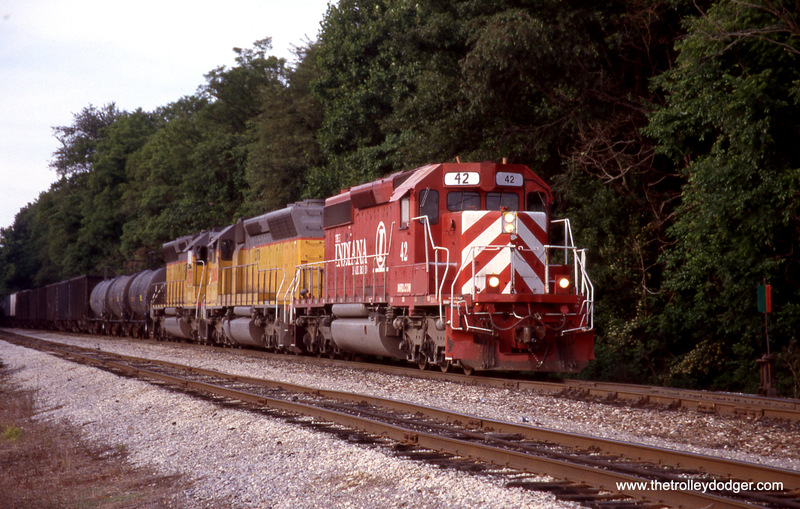 Southern Indiana S-2M 103 travels through the back yards of Watson on it’s way to the CSX interchange. 8. Another view of Southern Indiana S-2M 103 at Watson. 9. To me this photo has a very strong traction “feel” to it. With the traction orange locomotive, pole line, and side of the street running all that is missing is over head wire and a trolley pole. 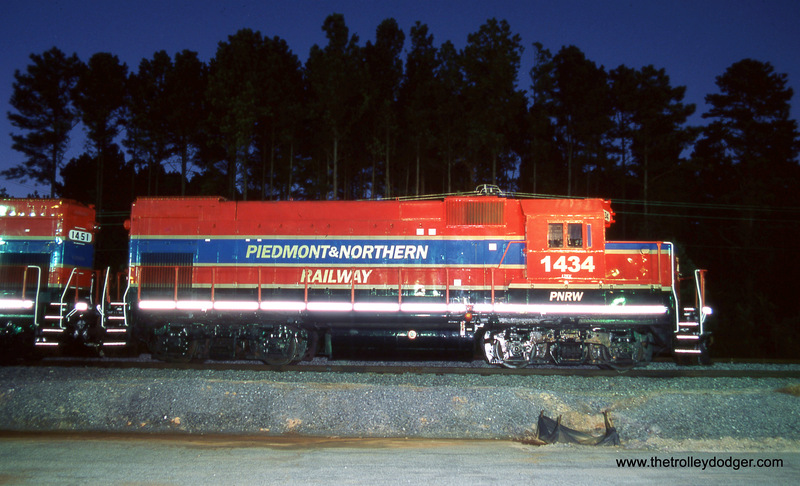 S-2M 103 is arriving at the CSX interchange at Watson. 10. 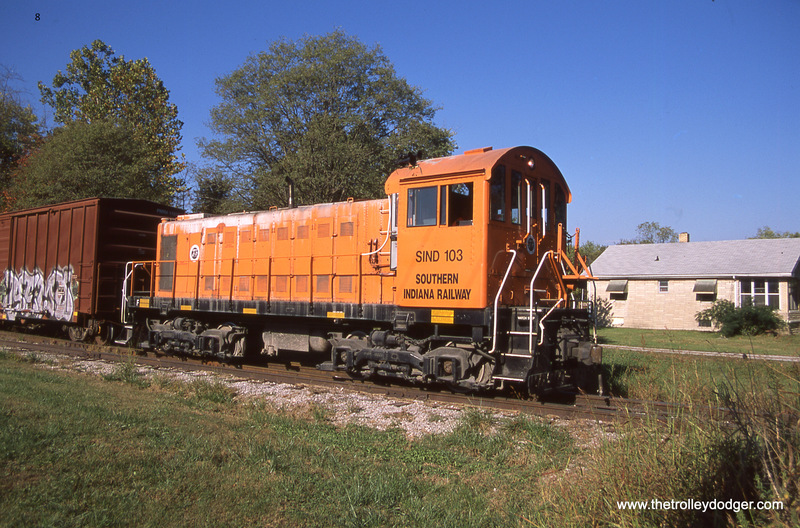 Southern Indiana S-2M 103 at Watson, IN 10-7-15. 11. 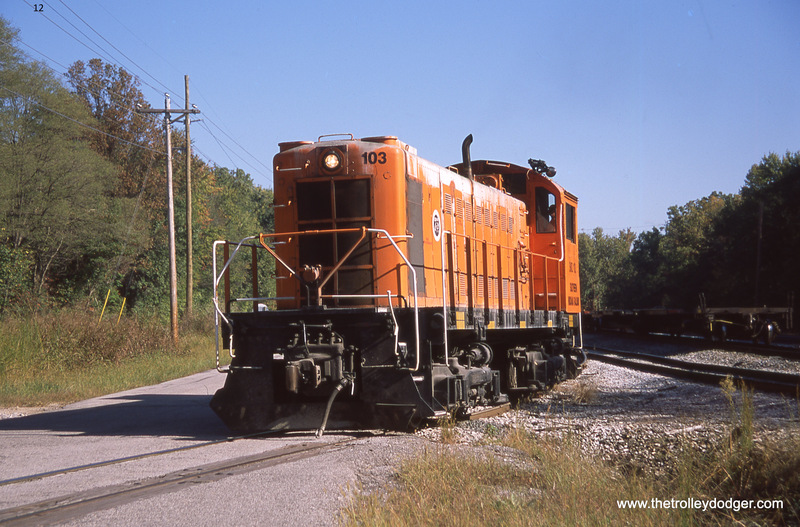 Southern Indiana S-2M # 103 crossing Watson Depot Road in Watson, IN. 12. with the Interchange work is finished number 103 heads back to speed lite. 1. 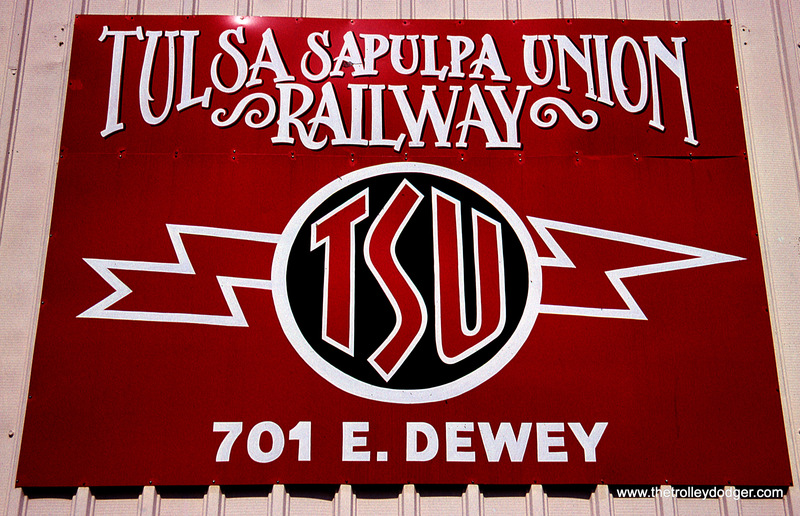 Tulsa Sapulpa Union Railway sign at the enginehouse in Sapulpa, OK.
2. 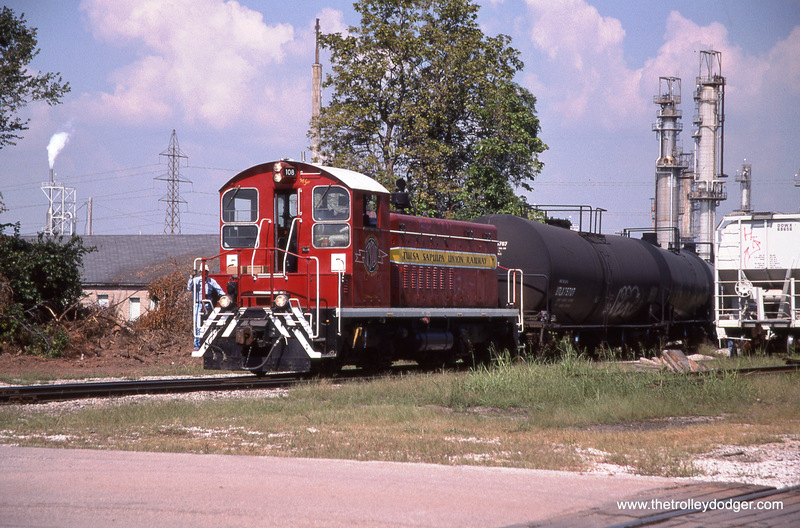 Tulsa Sapulpa Union SW-1200 # 108 switching the Sinclair refinery in Tulsa OK on September 26, 2008. 3 & 4. 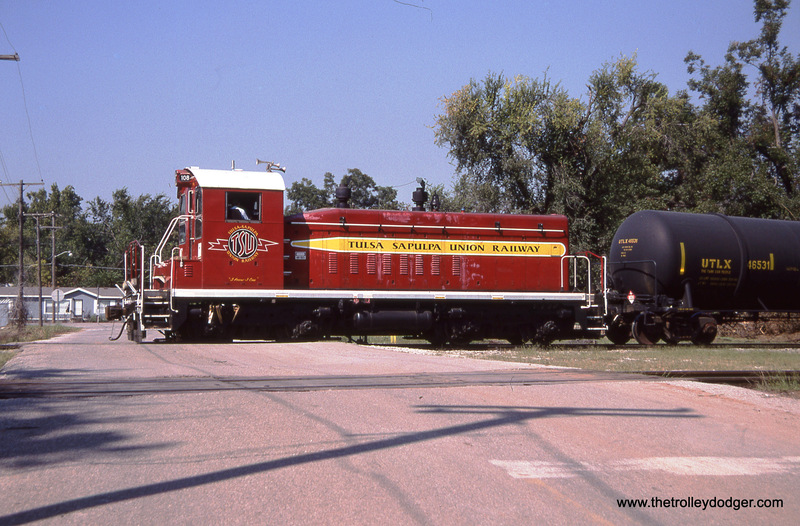 Tulsa Sapulpa Union SW-1200 # 108 is crossing 37th Street SW in Tulsa, OK.
5 & 6. 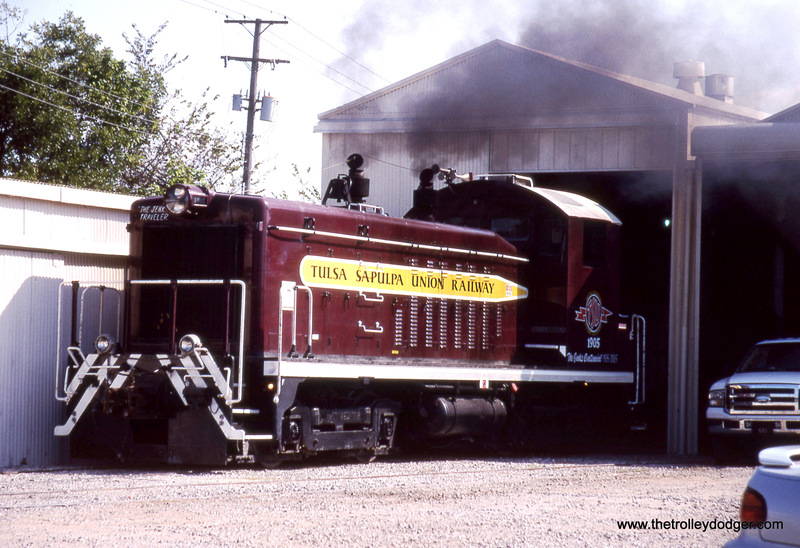 A couple more shots of Tulsa Sapulpa Union SW-1200 # 108 switching the Sinclair Refinery. 7. Number 108 with the City of Tulsa in the background. 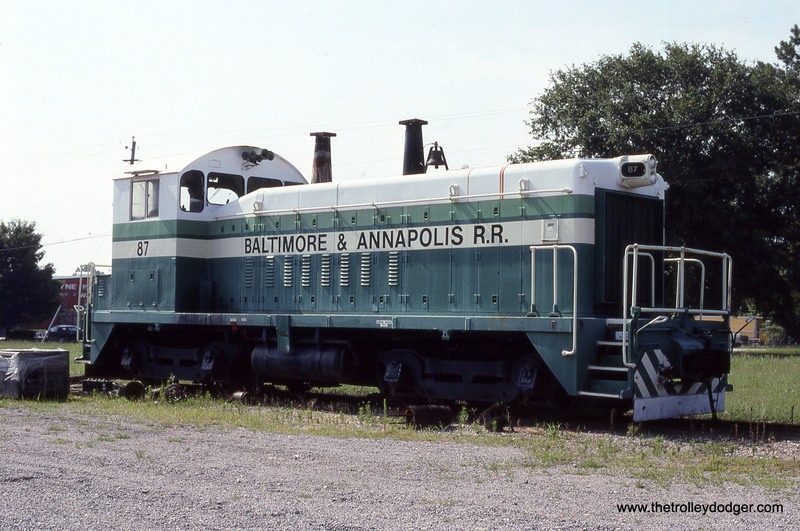 Although this ALCO powered railroad operates on former Erie and Pennsylvania railroad trackage, it bears the name of a former interurban line that once operated in the same area. 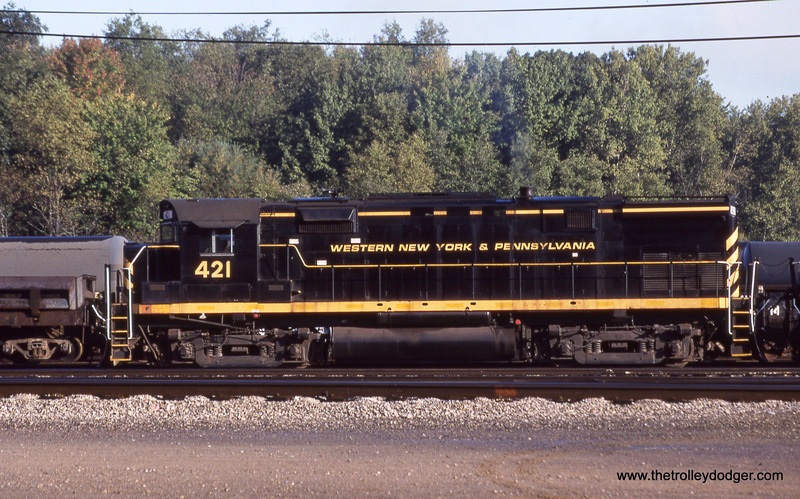 The Western New York & Pennsylvania Traction Company began operations in 1894 and connected Olean, NY and Allegany, PA. The line ceased operation in 1921. 1. 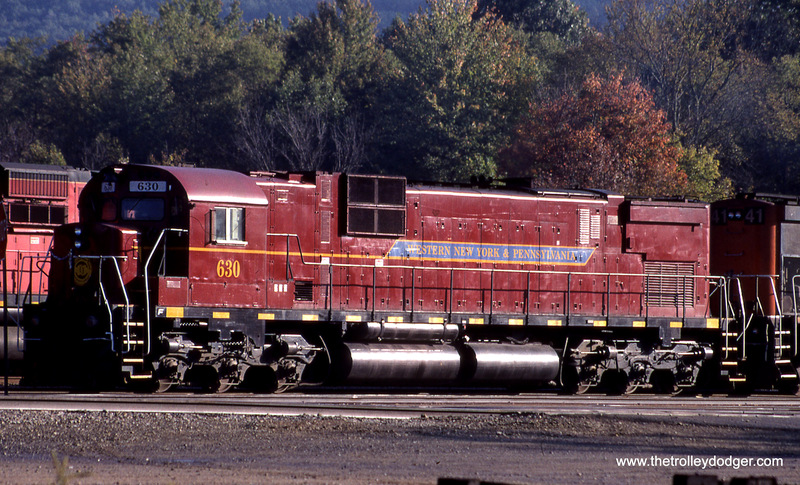 WNY&P M-630 # 631 at the Olean, NY locomotive facility. 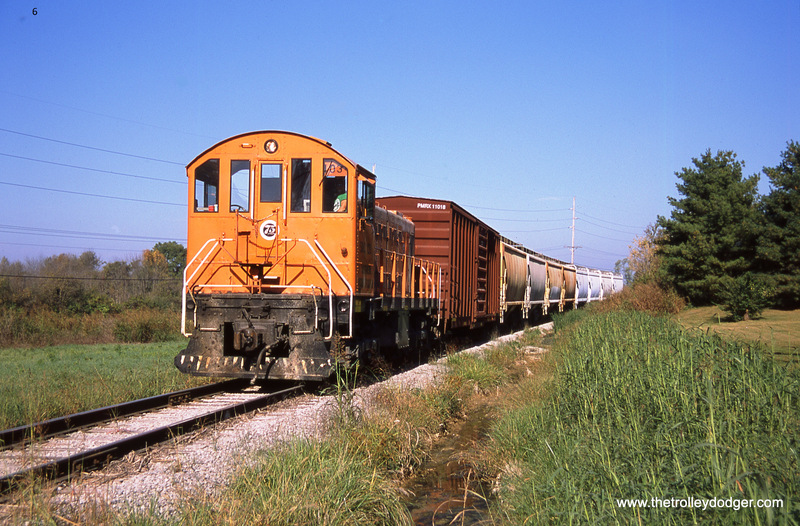 This railroad operates tracks once belonging to the Illinois Central and Milwaukee Road. 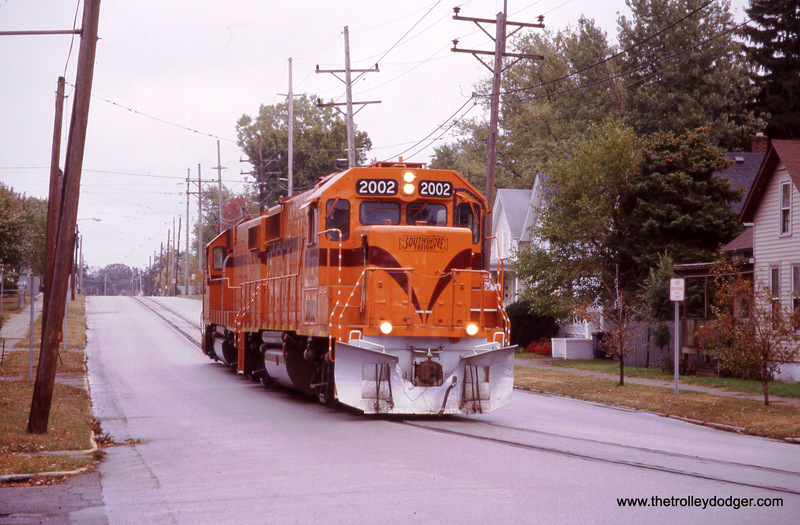 Nonetheless its locomotives carry the name of that famous Midwest Interurban– the Indiana Railroad. IR hung on for a few years after the depression but in 1941 a wreck with fatalities south of Indianapolis put an abrupt end to the last operation of interurbans in Indiana (other than the South Shore Line). 2. 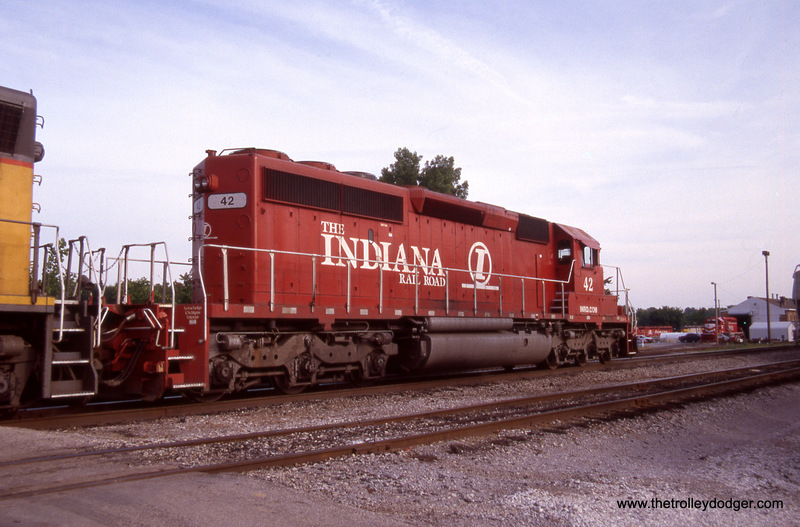 There is no missing the Indiana Rail Road name in logo on Indiana SD40-2 # 42. 3. 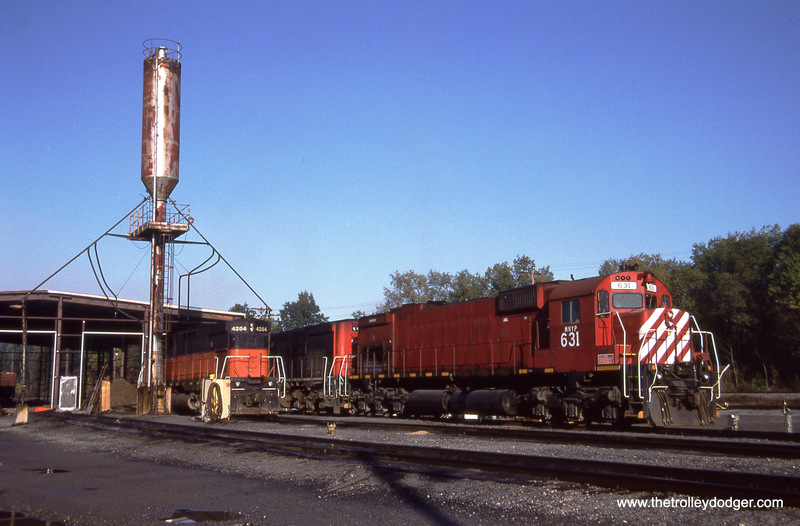 An SD-9043MAC on a unit coal train is not what immediately springs to most railfan’s mind when interurban railways are mentioned. However, with the name of a former traction company emblazoned on the locomotive, that was exactly what I was thinking about while watching this train. Indiana Rail Road # 9005 and 9006 power a coal train at Switz City IN. 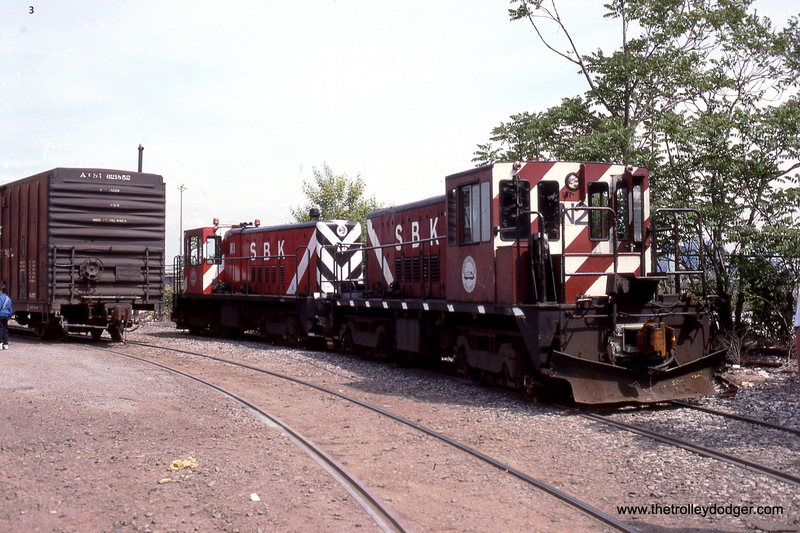 This New Jersey short line started running trains on former Pennsylvania-Reading Seashore Lines and Central Railroad of New Jersey tracks owned by NJ Transit and Conrail in 1983. 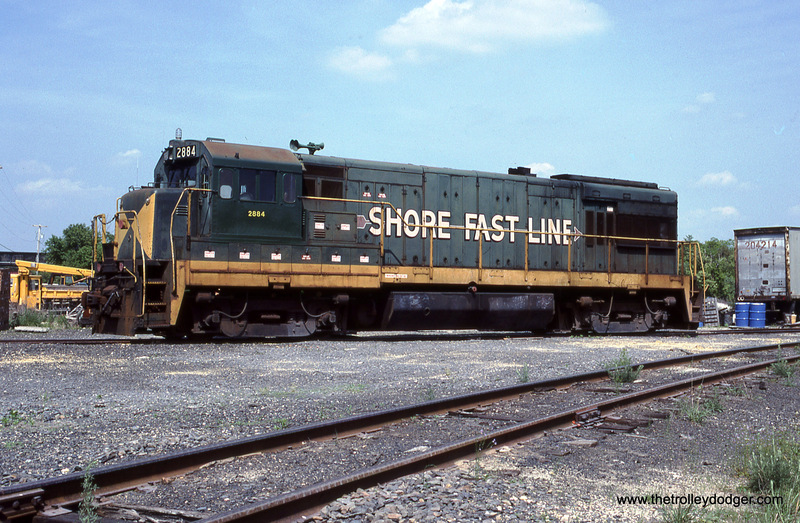 Interestingly, the management decided to name the railroad for, and paint the locomotives in the paint scheme of, the Atlantic City & Shore Railway known as the Shore Fast Line. 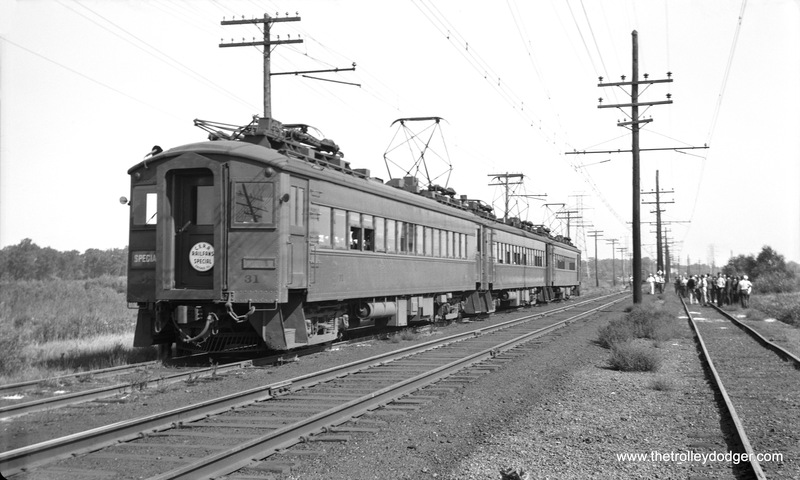 The Shore Fast Line was an electric interurban railroad running from Atlantic City to Ocean City, NJ, by way of the mainland communities of Pleasantville, Northfield, Linwood and Somers Point. The line ran from 1907 until 1948. 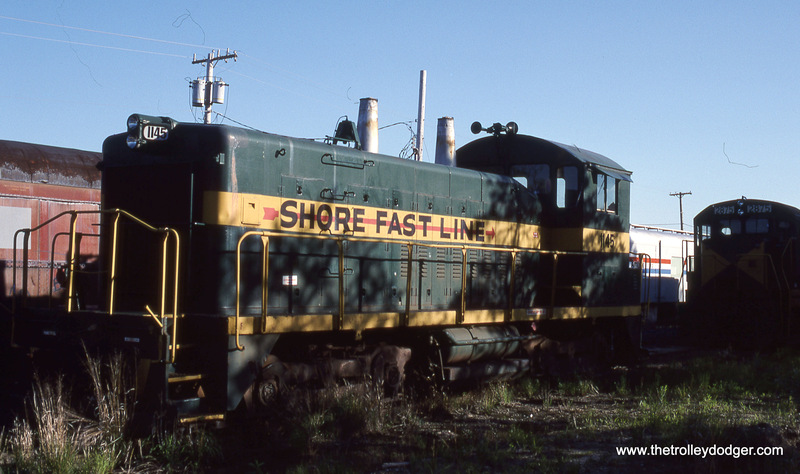 The Shore Fast Line short line railroad changed ownership and its corporate name in 1991 becoming the Southern Railroad of New Jersey. 2, 3, & 4. 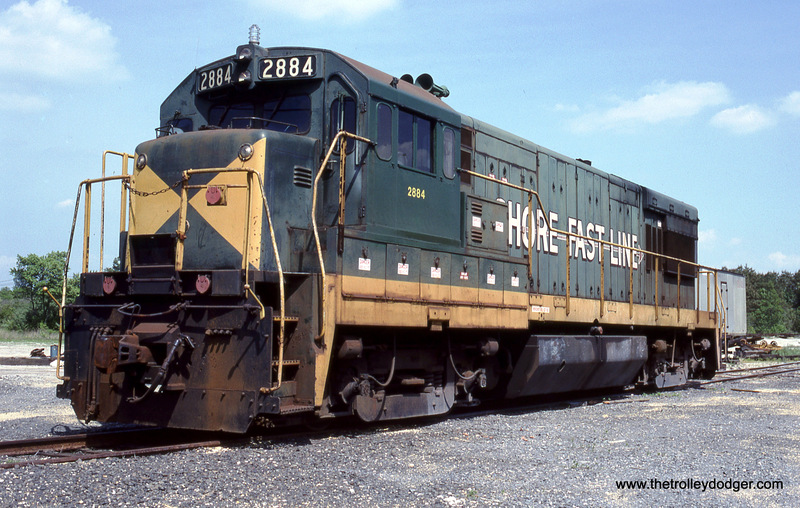 Shore Fast Line U30B # 2884 at Winslow Junction, NJ. 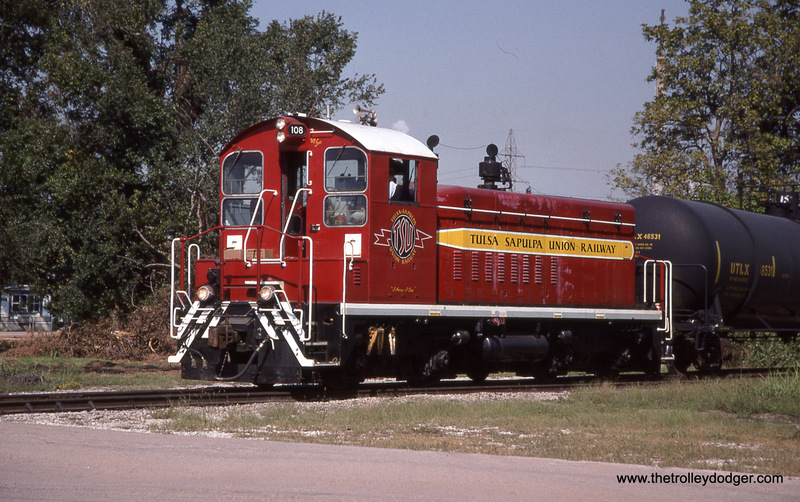 5-15-91 The triangles on the nose of the 2884 are the same as the ones that were painted on the ends of the AC&S Railways streetcars! 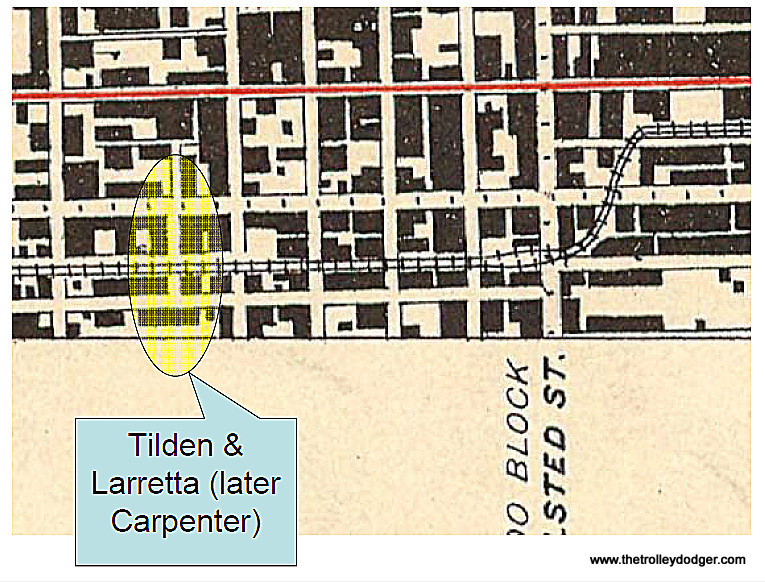 I am researching a family group that lived at the intersection of Larretta Ct (aka Loretta Ct) and Tilden Street (later renamed Carpenter) in Chicago. This area was surrounded by Aberdeen, Van Buren, Morgan and Congress (now the Eisenhower Expressway). The time period of interest is 1900 to 1940 during which the Garfield Park branch of the L train ran along Tilden, perhaps along properties on the south of Tilden Street. Would someone have photos of the tracks in this area that might show buildings in the background? Beside an image, I’m trying to get a sense of living along narrow streets with lots of residents and a train going through the neighborhood repeatedly. 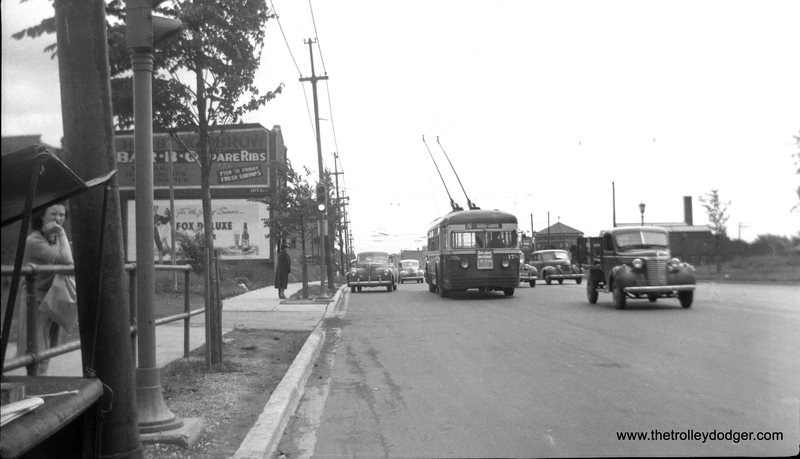 I did find a photo showing the end to Tilden at Racine with a streetcar on Rancine going under the elevated tracks. It showed a Tilden street sign but not anything for Tilden street. If the Google car was there, I’d move it’s position ahead and point it left. 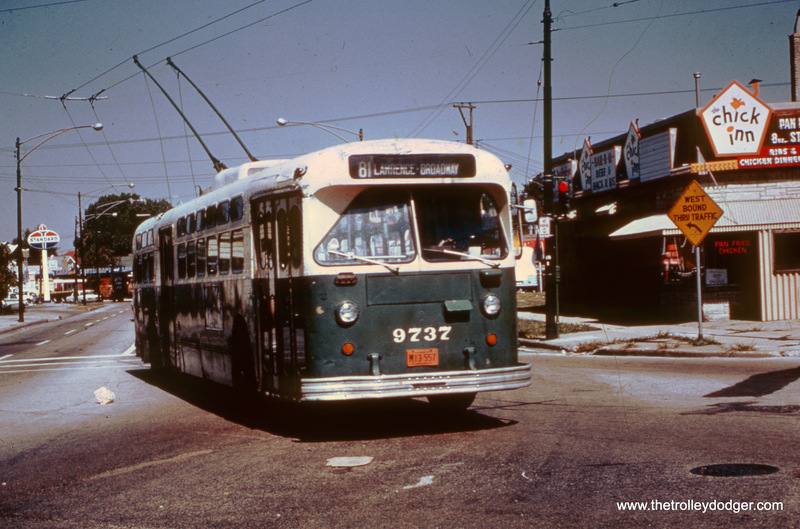 We have (in previous posts) run various pictures of the Metropolitan “L” on the near west side. If you type “Garfield” in the search window at the top of this page, these should come up. Otherwise, we’ll see if our readers have more pictures to share, thanks. I just found these 1950s railfan videos. They include action shots of CTA 6000s, 4000s, wood cars, PCC streetcars, Red Rocket streetcars, buses, North Shore Line and CA&E trains, Diesel and Steam locomotives, Illinois Central and South Shore trains. Also you can see the CTA yards at Laramie, Logan Square, and Wilson. Thanks very much. These videos should be of particular interest to our readers. 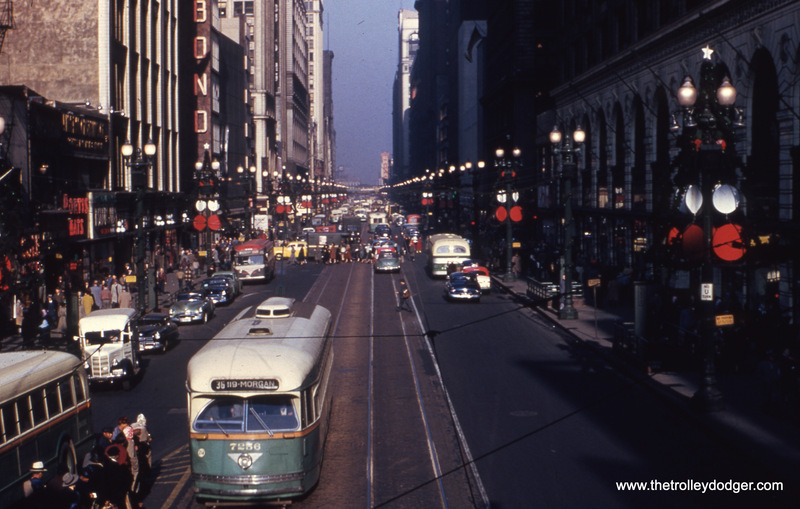 Some of these films were made circa 1952-54, since red Chicago streetcars are seen running in service. 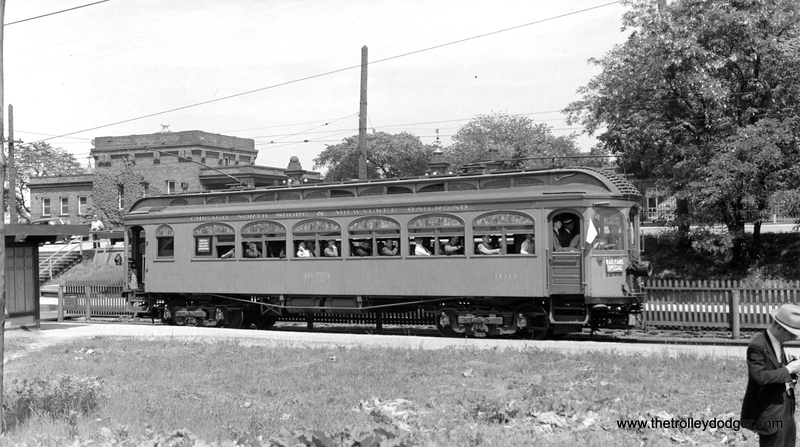 The CA&E portions were taken prior to September 20, 1953, when service was cut back to Forest Park. 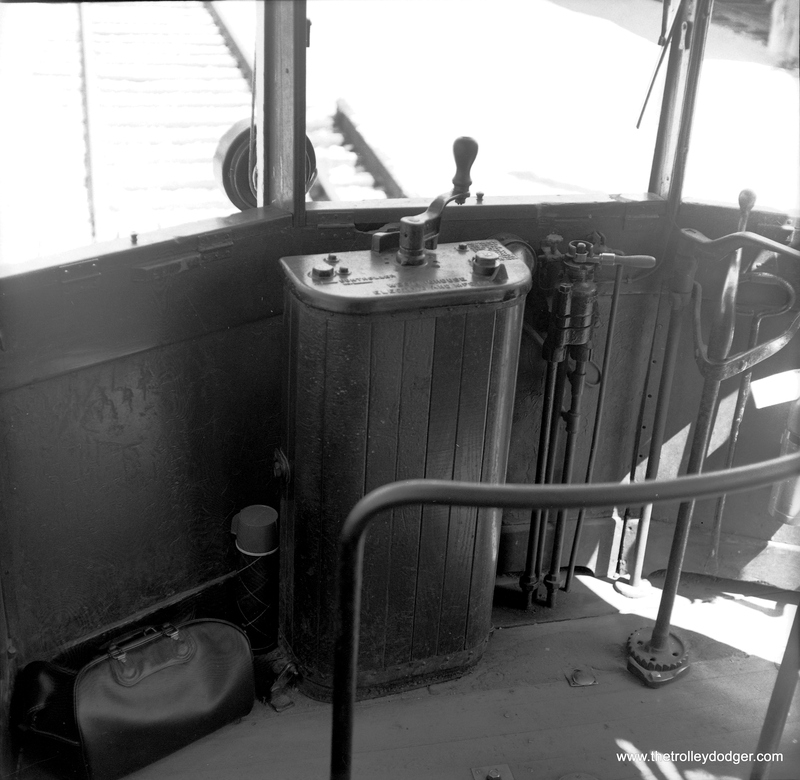 There are also shots of Milwaukee streetcars. 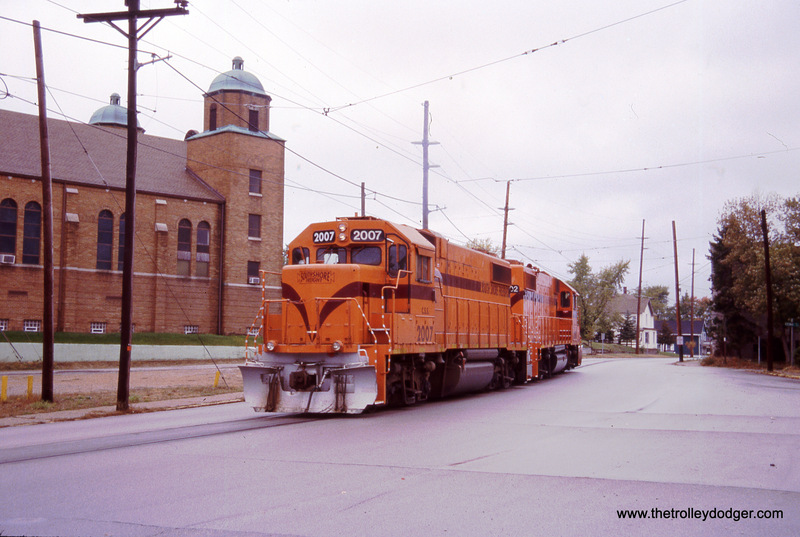 The South Shore Line video includes film of East Chicago street running, which was relocated adjacent to the Indiana Toll Road in 1956. 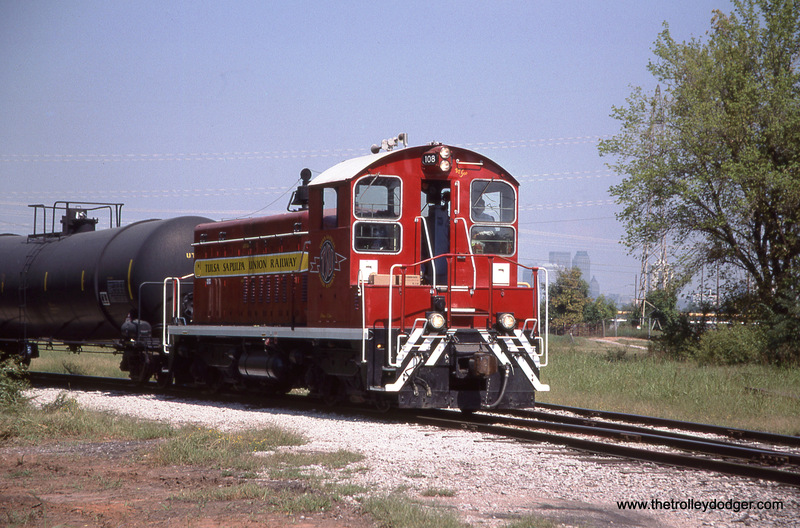 You can tell this is East Chicago, because it’s double-tracked. 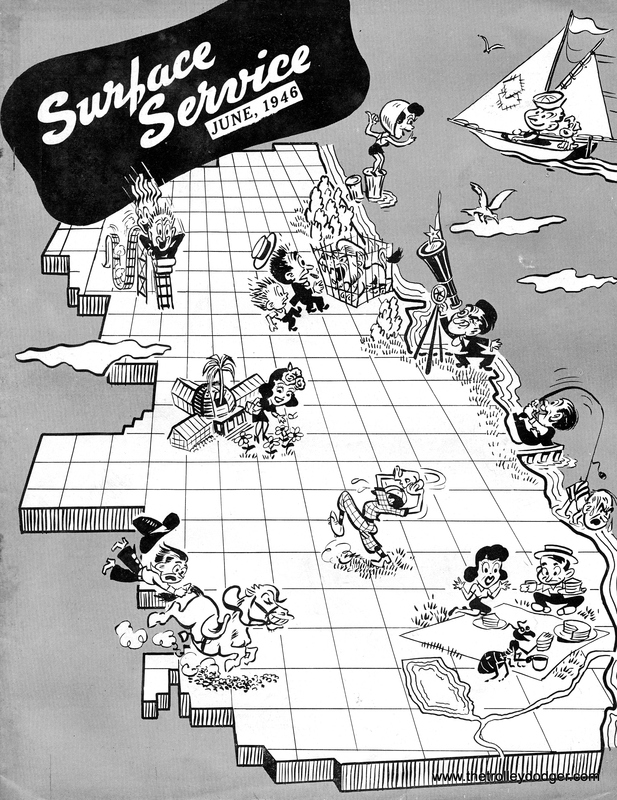 The South Shore’s other street running in Michigan City and South Bend was almost entirely single-track. 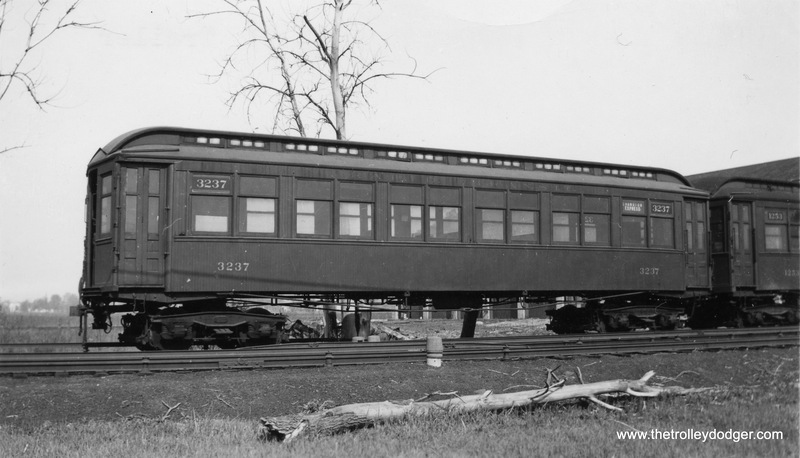 I was wondering if you had any information or photos concerning the Grand Trunk Western Railroad that ran commuter service within Chicago up until at least 1935. 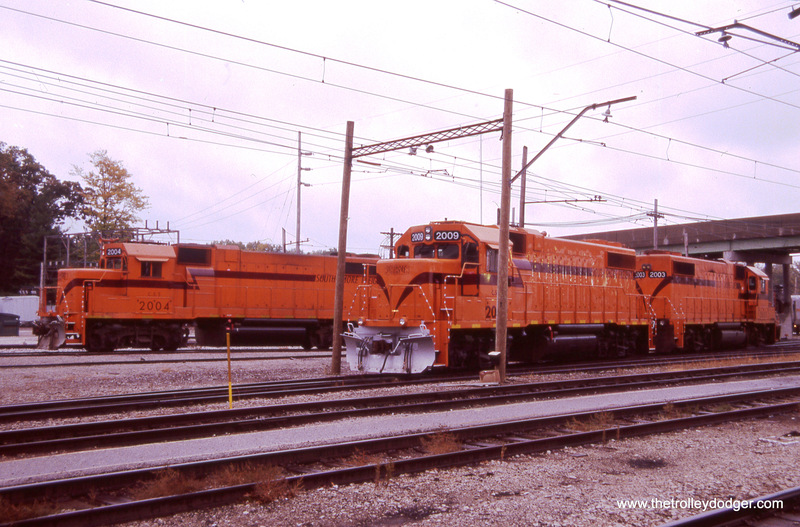 My main interest is the Main Line-Illinois, which ran on what has been freight rail lines since then I believe, with limited commuter service until 1971. Here’s a link to where I found out about these trains. These were probably not trolleys but I’m not sure. There is one station building remaining at Chicago Lawn which I’ve seen along with the steps of the station at 59th St. Further along that line there are probably more station buildings standing. Any photos from anywhere on this line would be incredible imo. I am not an expert on the Grand Trunk Western, which was never electrified, always being either steam or diesel, so I asked a couple friends for their thoughts. Well, I don’t know a heck of a lot about GTW commuter service, but I do know a little. Service ran until the 1950’s apparently with a couple of trains each way between Dearborn Station and Harvey. There was a station at 63rd/Central Park that was in use for thru trains until 1971 as far as I know. 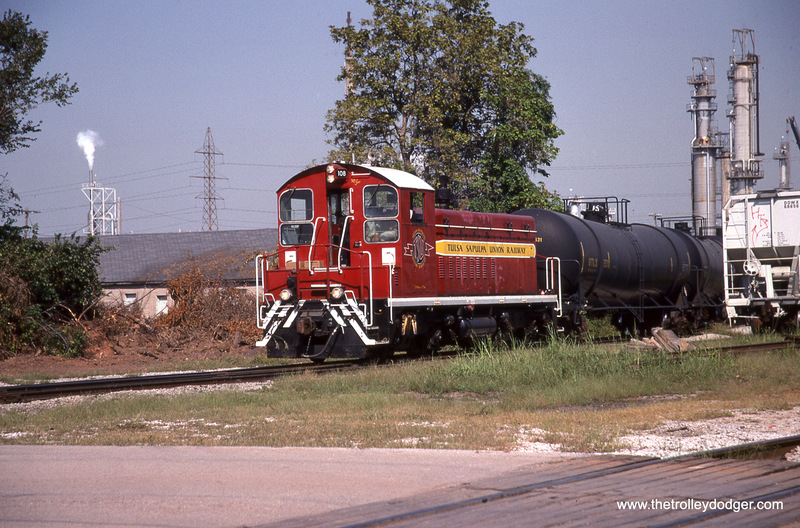 There were other stations that still existed into the 1970’s such as the one in Harvey (at Racine?) and one at Central Park and 82nd or so. But now the only ones are remnants at 59th and 63rd. By the way, that was a very late elevation, after WW2. Operated until 1934 (to Harvey). Until circa 1917, it operated all the way to Valparaiso, IN. Indeed, the stairs to the 59th St station are still standing (as per a Google Earth view a few days ago), as is the depot (which has served as a home for at least two unsuccessful restaurants over the years at 63rd). There were numerous other stops as well. There are signs (evidence) of the Ashland station (platform railings). A trip along the line about 6 years ago revealed little other evidence of stations, except that the depot at Griffith remains (it has been moved and is part of the museum there). The depot at Sedley, IN (now a private home) remains, as does the depot at Valparaiso (which I understand has been recently removed). I have pix of the depot at Eldson (51st St). Have a photocopy of a timetable (back when service ran to Valpo). Have been at virtually all the station locations along the line…with pix at each (as they exist today). For whatever reason, the station at Harvey (which I understand stood until the early 1970s) managed to be very camera-shy (interestingly, pix of the nearby B&OCT station is Harvey do exist). 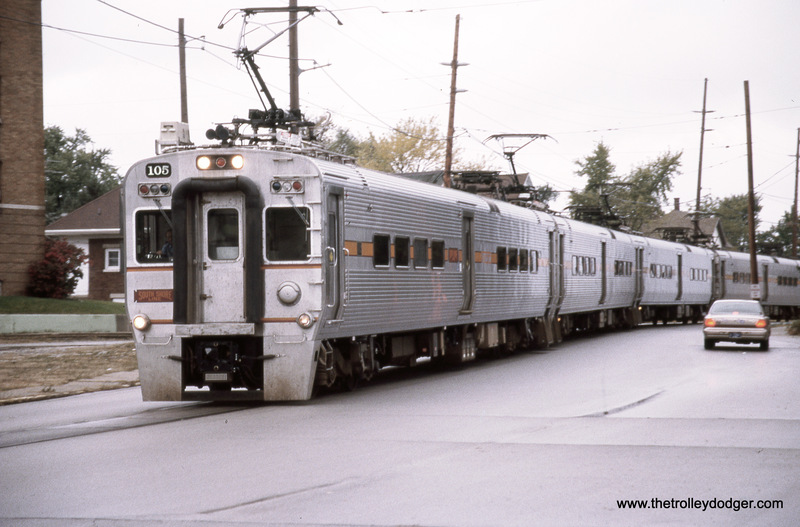 The GTW intercity trains (which made their last trips on Friday, April 30, 1971 (Amtrak eve) did serve both the stations at 63rd (known as “Chicago Lawn”) and Valparaiso. We thank both Andre and Bill for sharing this. Here is a four minute clip of an action sequence from the 1953 film “City That Never Sleeps” which was mostly filmed on location in Chicago. I thought you might be interested since the action takes place on the L tracks with two 4000-series trains traveling in opposite directions. In this scene, gangster Hayes Stewart — who has just murdered Chicago Police detective John Kelly — is pursued by officer John Kelly, Jr., the victim’s son. The part of Hayes Stewart was played by actor William Talman. He started his career playing criminal types, but is best known for his portrayal of district attorney Hamilton Burger in the “Perry Mason” TV series. The part of patrolman John Kelly, Jr. was played by Gig Young, a charismatic actor who unfortunately never achieved his true potential. In the film, the dispatcher gives the location as “between Kinzie and the river just east of Wells” which would indicate the old North Water Street terminal or possibly the Merchandise Mart. However, that was artistic license; the actual spot where this was filmed was between Grand and Division on the “Evergreen Connector” portion of the Logan Square line. 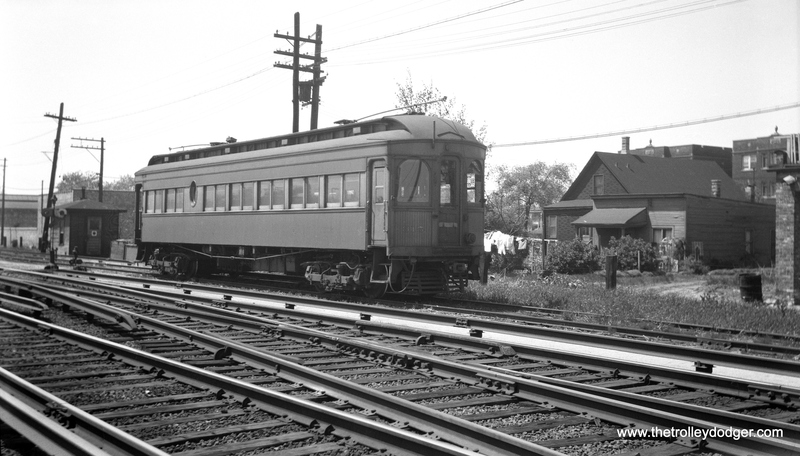 With the opening of the Milwaukee-Dearborn subway in 1951, this portion of the L was no longer used in revenue service, but it was retained for equipment transfers since it was the only connection between the Logan Square route and the rest of the L system. I continue to enjoy your website. Keep it up. I assume that when this was filmed, the third rail was turned off. When actor Bill Talman fell onto the third rail, it looks like he was holding some sort of prop in his hands which made it look like an electric spark. Perhaps if he had given up smoking sooner, he might have been able to outrun the policeman. Thanks… and thanks also to Kenneth Gear for another great post! Keep those cards and letters coming in. 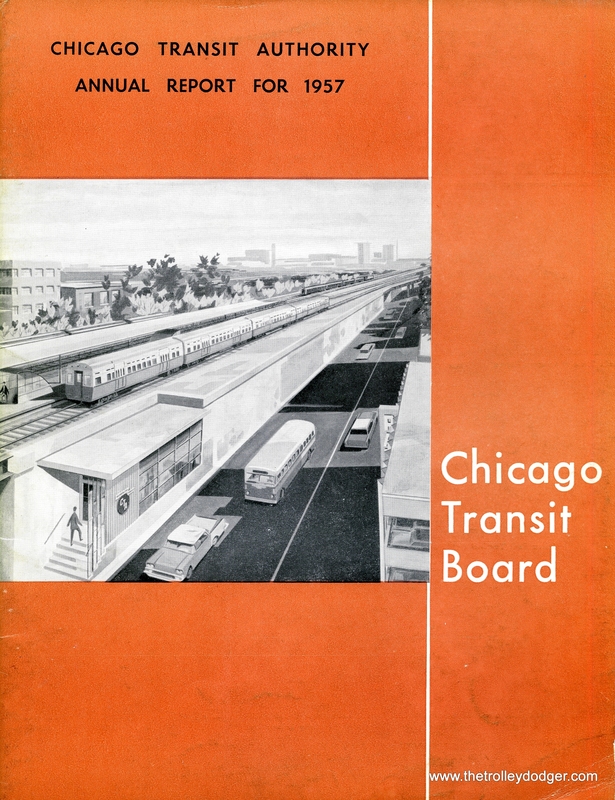 PS- Work continues on our upcoming book Chicago Trolleys, which is now in the layout and proofreading stage. Lots of work has been done on the text, and the final selection of photos has been made. We will keep you advised as things progress. 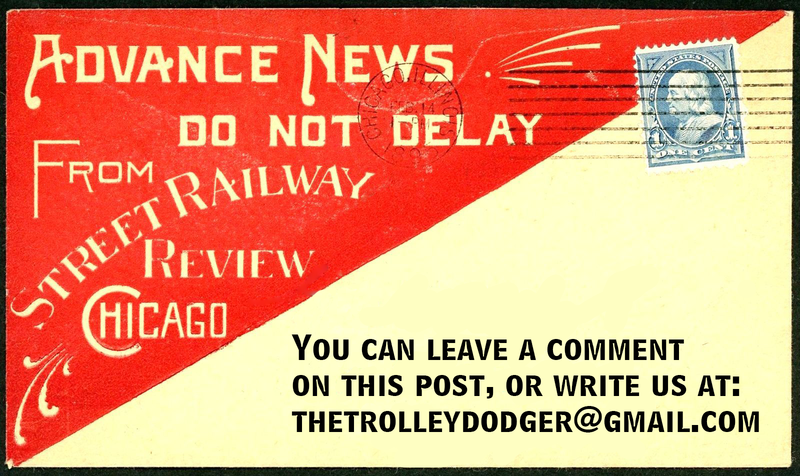 This is our 178th post, and we are gradually creating a body of work and an online resource for the benefit of all railfans, everywhere. To date, we have received over 265,000 page views, for which we are very grateful. Your financial contributions will help make this web site better, and are greatly appreciated. 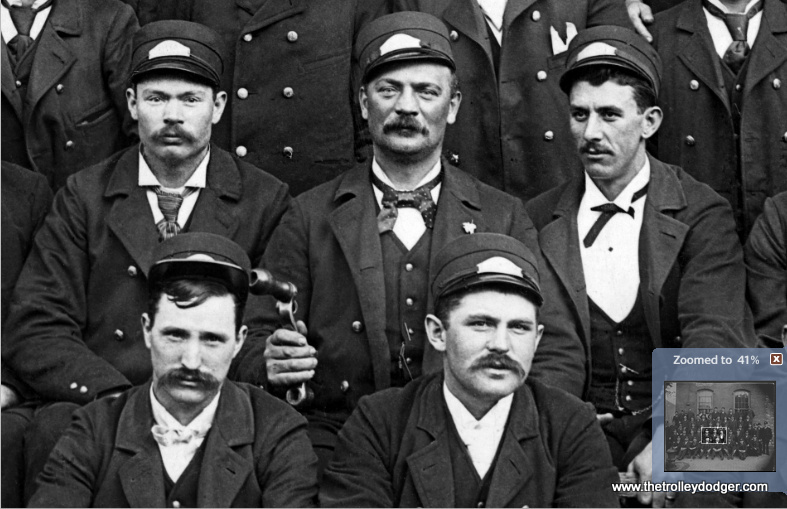 A remarkable photograph, this shows a group of early Chicago streetcar conductors and motormen, some displaying the tools of their trade (controller handles and switch irons). 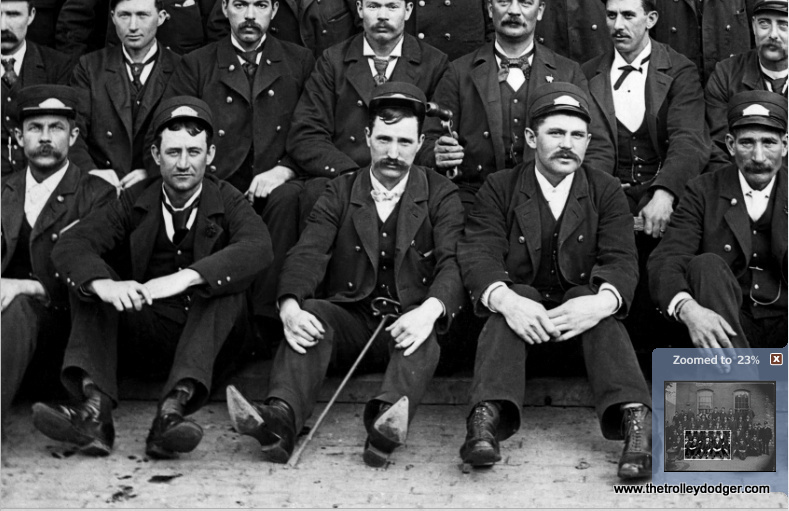 I am sure it was a tough job, and they look like a bunch of tough men. 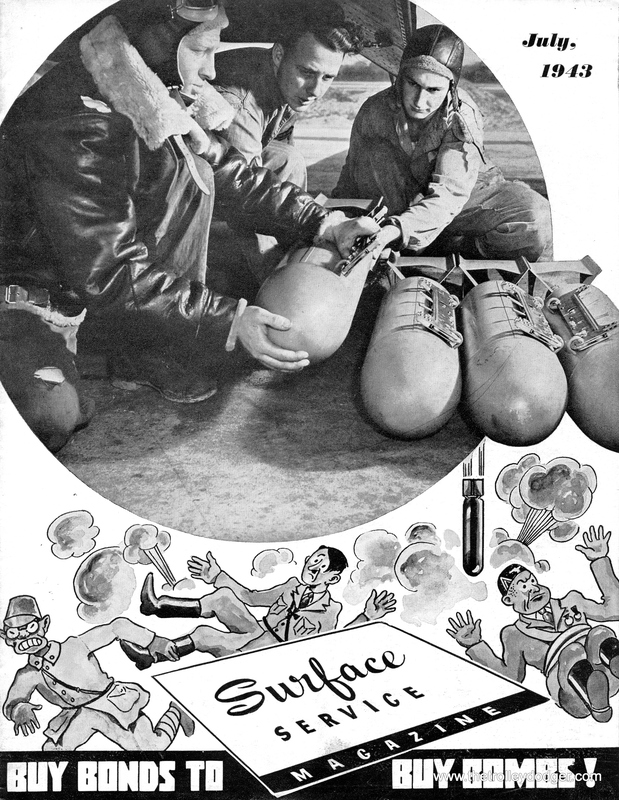 While Chicago’s population has always been diverse, integration did not come to their ranks until October 1943, thanks in part to wartime manpower shortages. 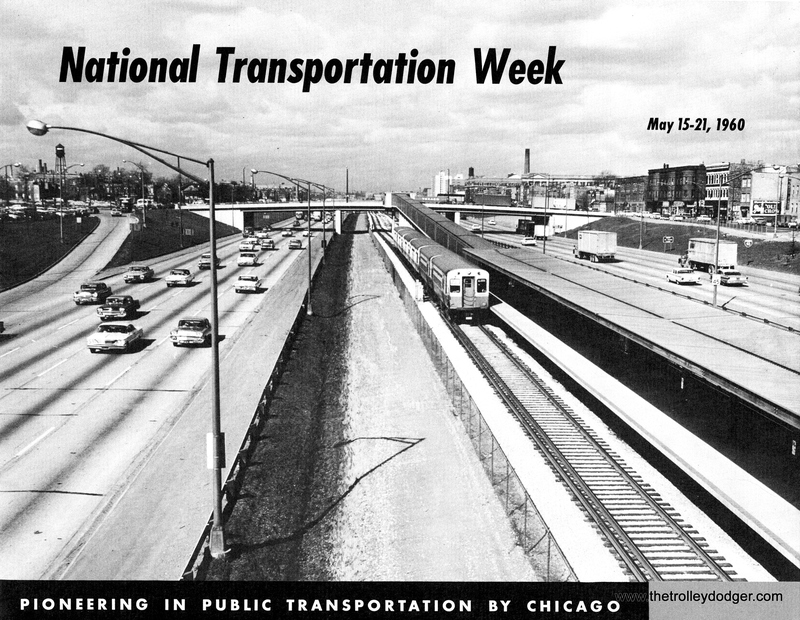 (And I do mean “manpower,” since the CTA did not hire its first female bus driver until 1974.) 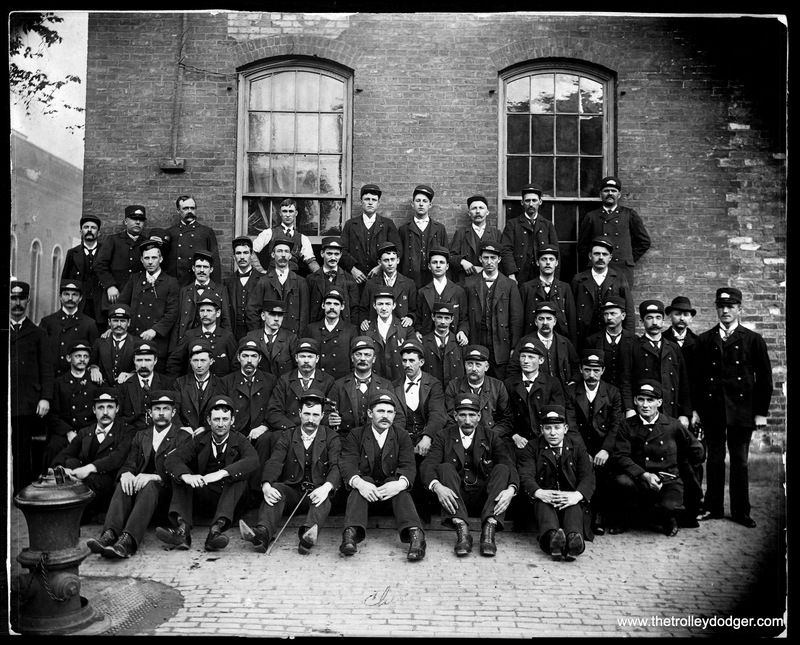 I am wondering if this photo shows employees of the Chicago City Railway. If anyone can shed light on this photo, please let us know. 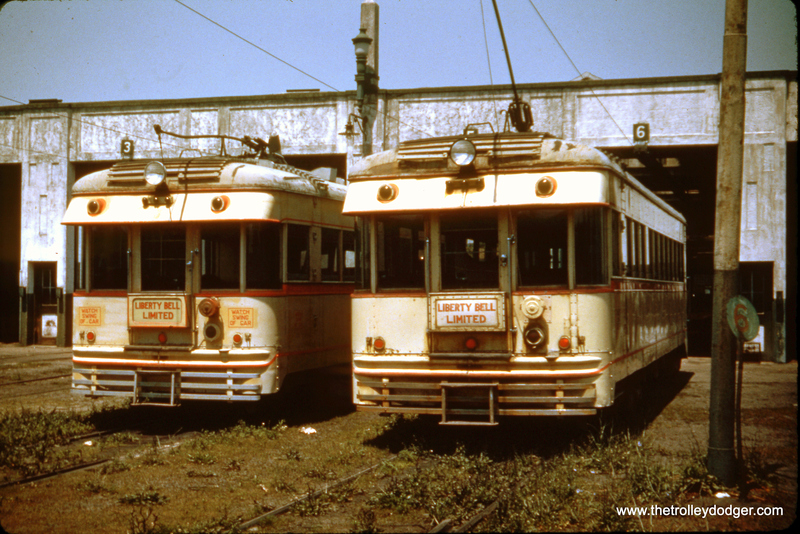 Lately, we have been hard at work on our upcoming book Chicago Trolleys. Meanwhile, new images have been piling up. It’s about time we started sharing them with you. Today’s batch is just the “tip of the iceberg,” so to speak. The group picture above is just such an image. 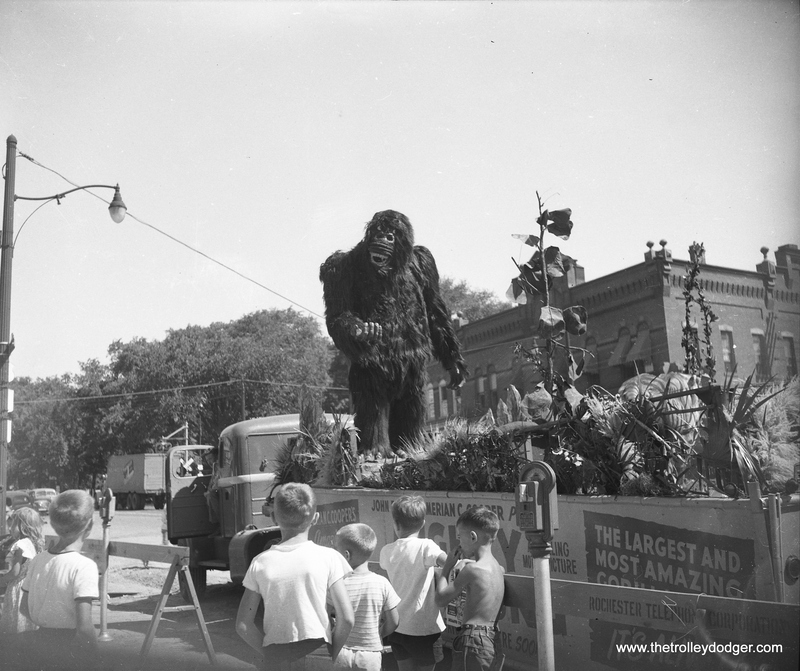 It came to us by way of a very large 11″ x 14″ negative. This in itself is rather remarkable. It was too big to scan all at once, but necessity is the mother of invention. I scanned the image in quarters, and then discovered free software from Microsoft that flawlessly “stitched” the four back together. As old as this negative seems to be, it may not be the original. I have a feeling this neg was made from a glass plate. Glass plate negatives are fragile, and there was some damage to the image, which I corrected using Photoshop. This took many hours of work, but the results speak for themselves. Chances are, this picture was taken between 1895 and 1915. 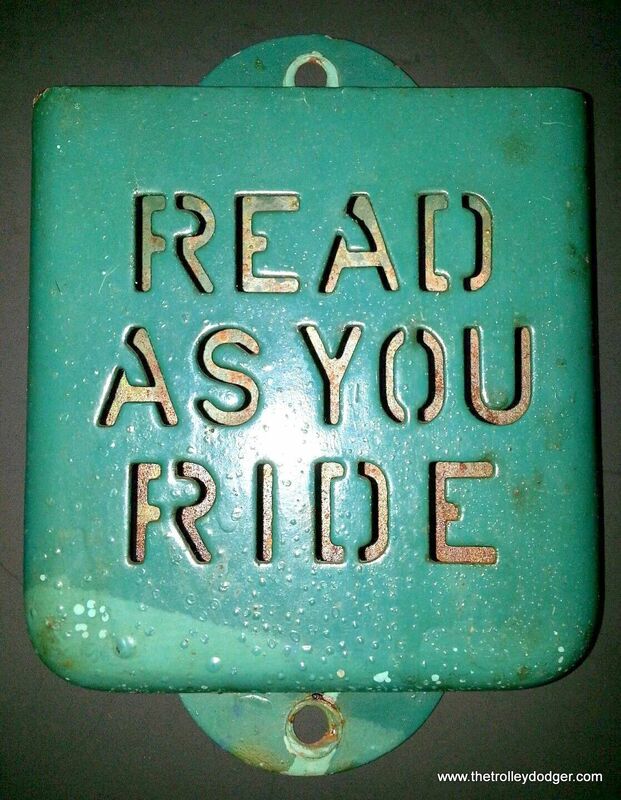 There are eight million stories in Railfan City. Here is how the image originally looked, before I spent several hours eliminating the scratch using Photoshop. The man in the middle not only has pointy shoes, but holds a switch iron. 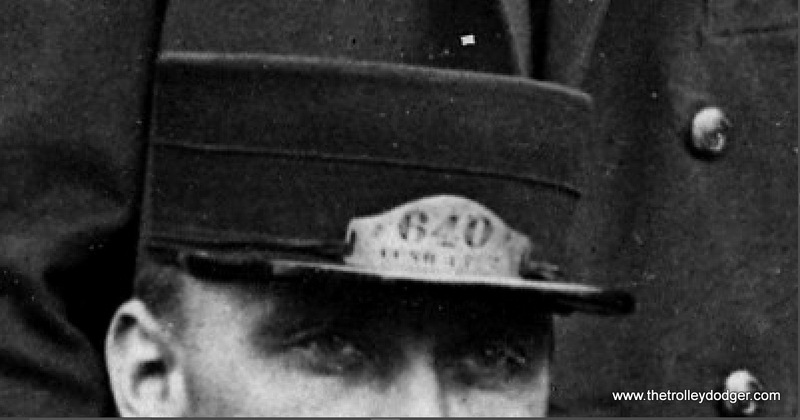 Perhaps this badge may offer a clue as to which private operator these men may have worked for. One of our readers thinks the badge might say “C & S C,” which could stand for the Calumet and South Chicago Railway Company, which was formed in 1908 through a merger of the South Chicago City Railway Co., and Calumet Electric Street Railway Co. 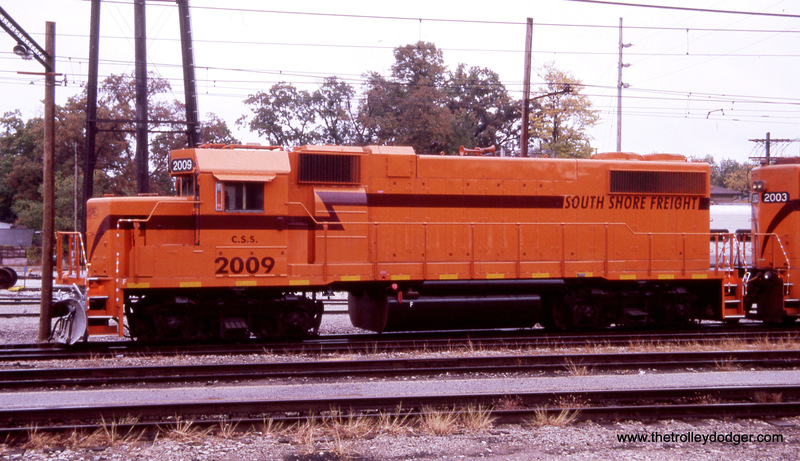 It operated on the far south side of Chicago. 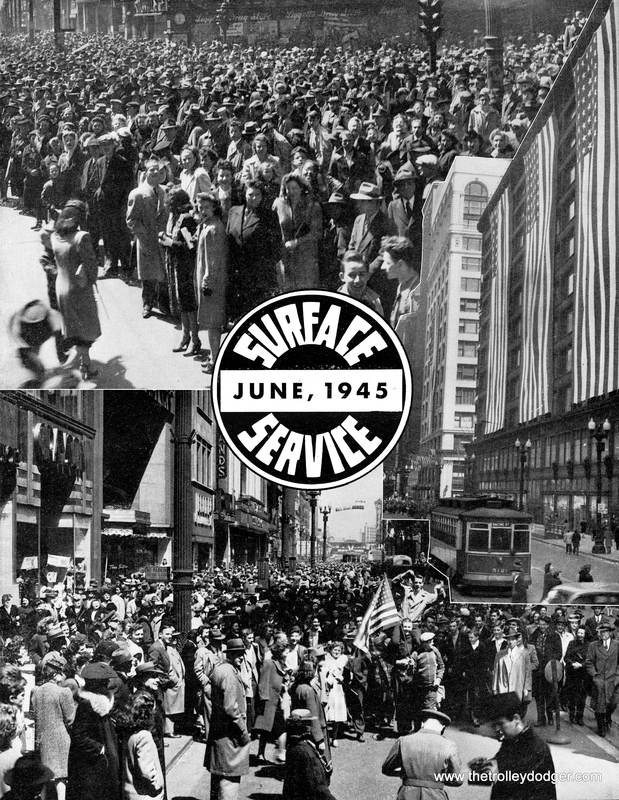 In 1914, it became one of the underlying companies that formed the Chicago Surface Lines. Of course, it’s pretty hard to make out. On the other hand, James Fahlstedt writes: “My take on the hat badge is that it reads CCSR. For what it is worth, it is put on the hat with and band or strap rather than fastened directly to the hat with split pins or similar device. The thing that I do not understand is that it is a metal badge. My CCR badge is leather. Could it read CGSR? Another thing I noticed is that there is something on the left side of the badge on the same line as the mystery letters that is totally illegible. Is a puzzlement.” CCSR probably stands for Chicago City Street Railway. Perhaps the mystery has been solved. 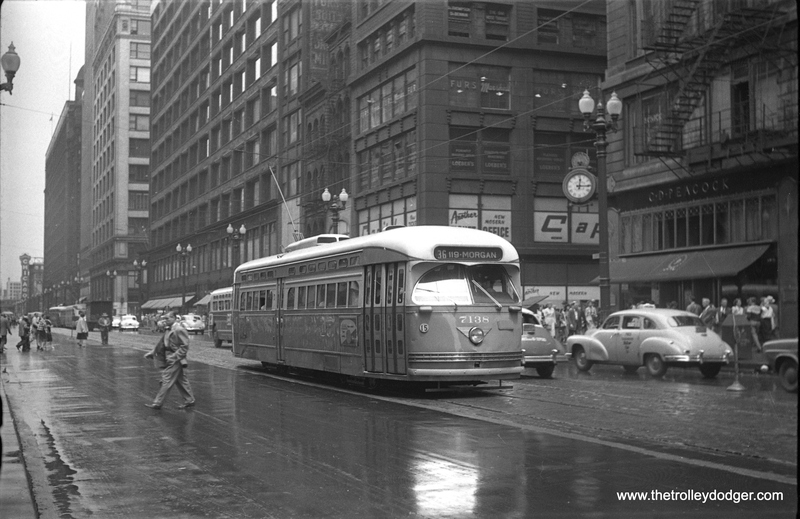 CTA PCC 7256 heads south on State Street at Van Buren in the 1950s. 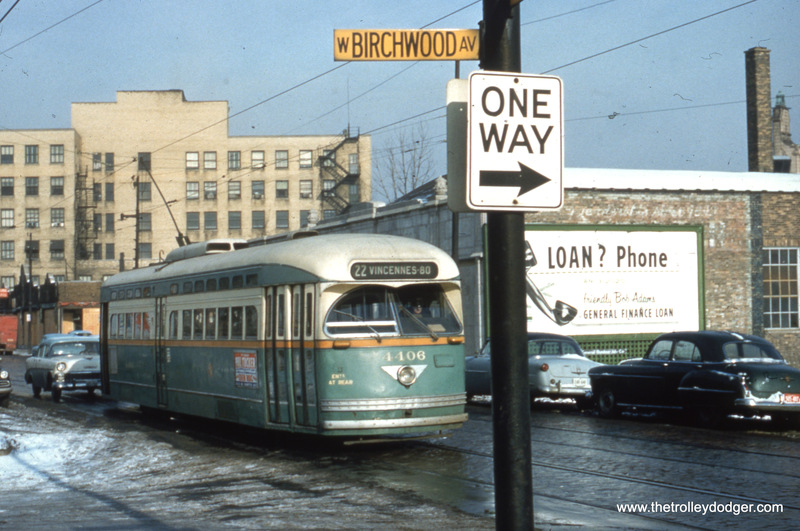 This mid-1950s view of PCC 4406 is at Clark and Birchwood, it having just left Howard Street, north end of Route 22. 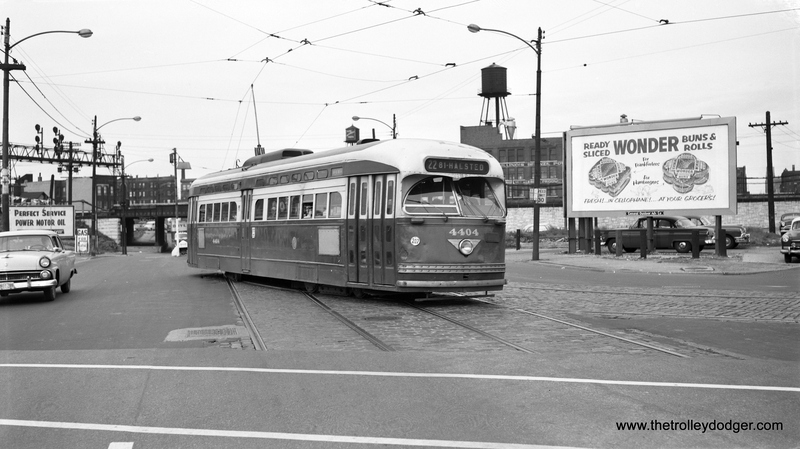 On January 1, 1954, eastbound CTA 1769 turns from Pine onto Lake Street, crossing the Lake Street “L” at grade. 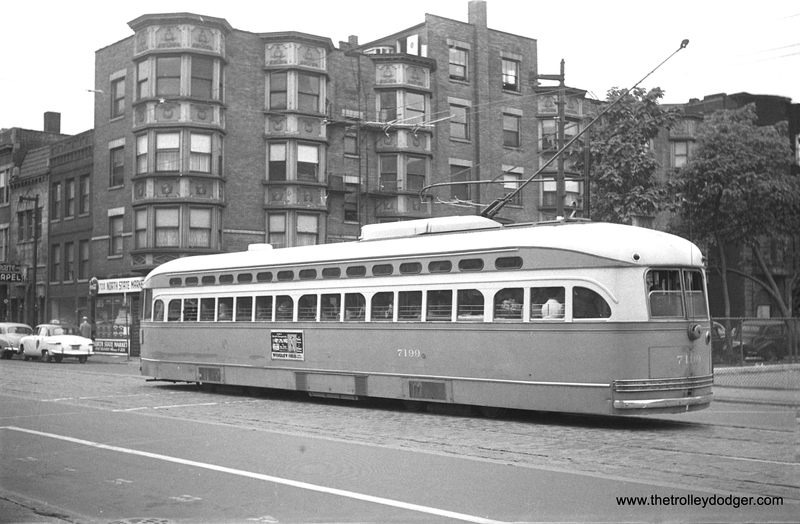 Streetcars were replaced by buses on May 30 that same year. 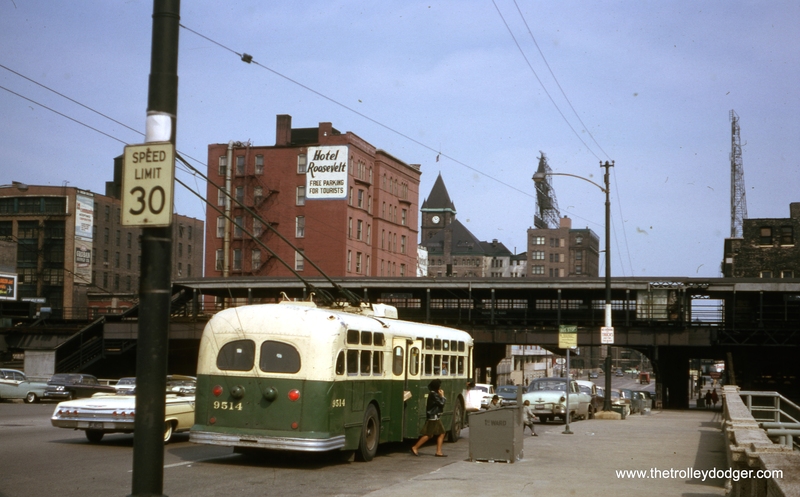 Passengers get off CTA trolley bus 9514, which is heading eastbound on Roosevelt at State in April 1964. 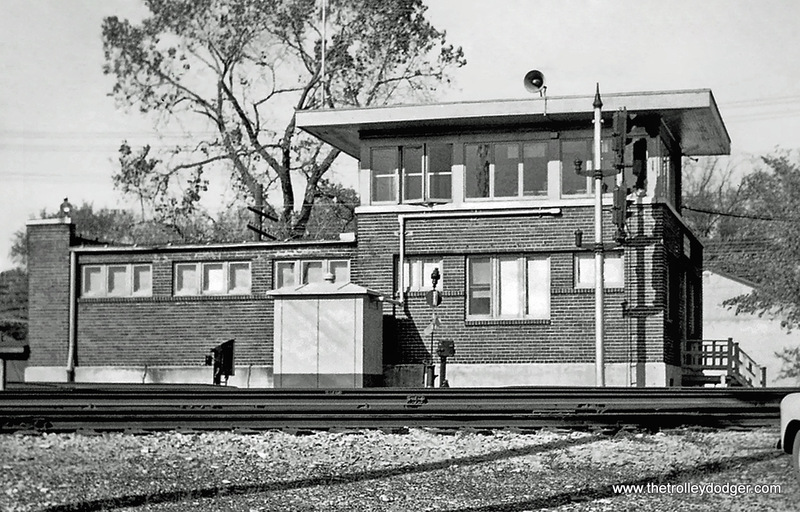 The Roosevelt Road station on the South Side “L” was closed as of January 1963, when the North Shore Line quit. 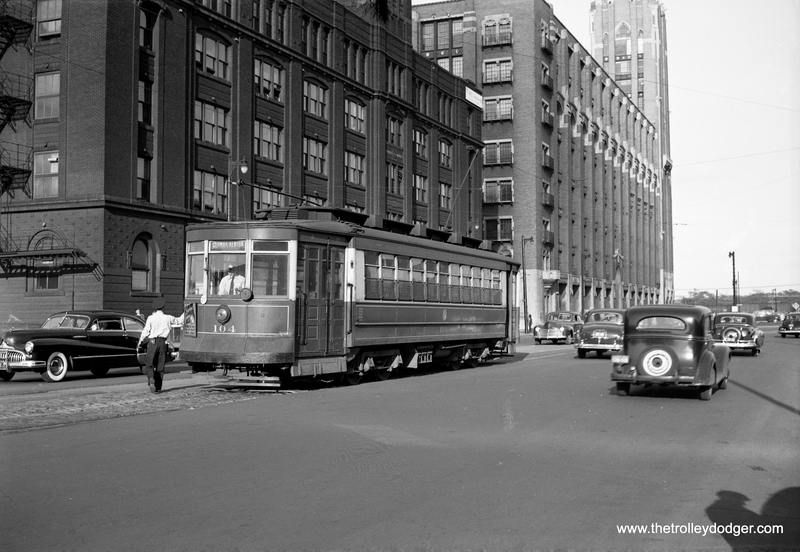 From 1949-63, NSL had exclusive use as N-S trains were routed through the State Street subway. These tracks were put back into regular service in 1969, with the opening of the Dan Ryan line, but the station was demolished and was not replaced by a new one until 1993, with the opening of the Orange Line. 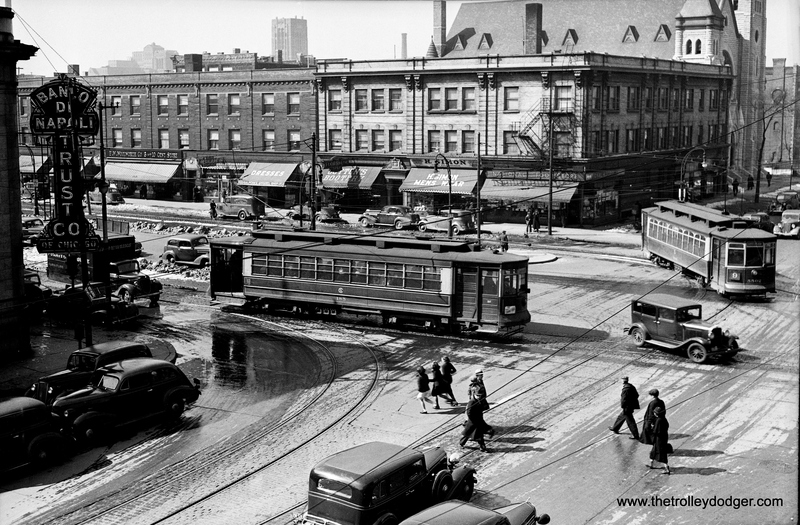 This photo shows the Kilbourn station on the Garfield Park “L” around 1954. By then, the station had been closed, and the stairways removed, in order to reduce running time due to the slow 2.5 mile temporary trackage at ground level east of Sacramento. The two-car train of CTA 4000s is about to cross the Congress Expressway, but the highway does not appear to be open yet. The “L” tracks were higher than normal at this location to cross railroad tracks just west of here. The line was relocated into the expressway median in 1958. The CRT 42nd Place Yard, the end of the line for the Kenwood “L” branch, probably in the late 1920s. 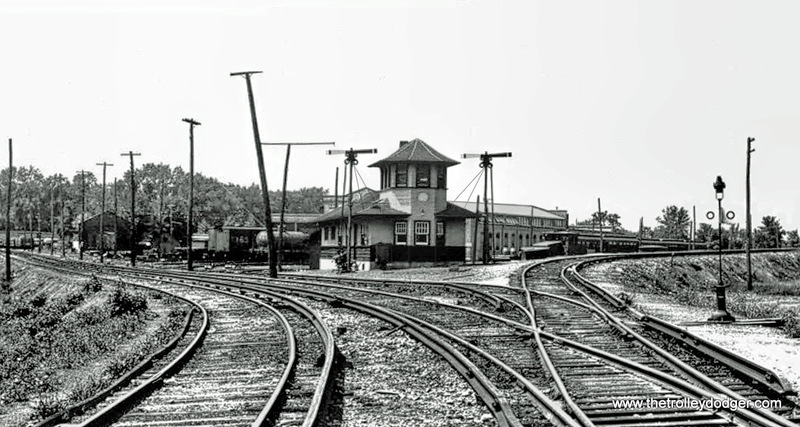 The Stock Yards “L” branch, looking east to Exchange, as it appeared on June 7, 1927. The North Side “L”, looking south from Montrose. On the right, you see the ramp leading down to the Buena Yard. CRT trailer 3237, possibly at Skokie Shops. 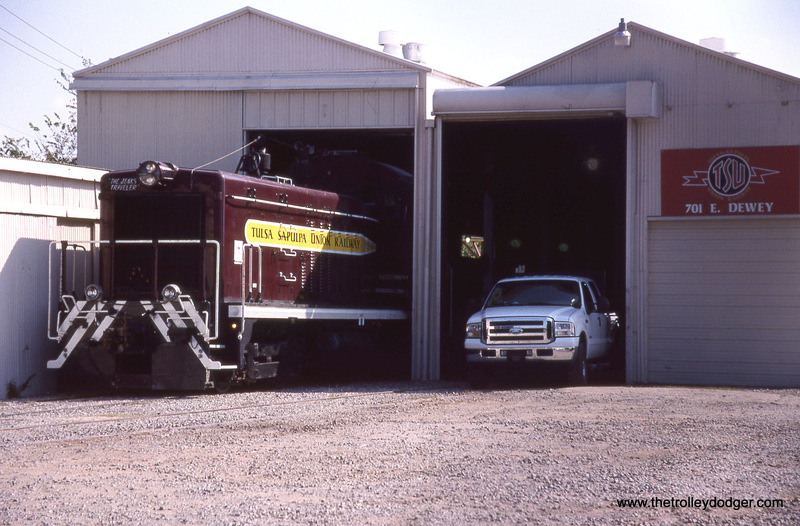 CA&E 315 at an unknown location. 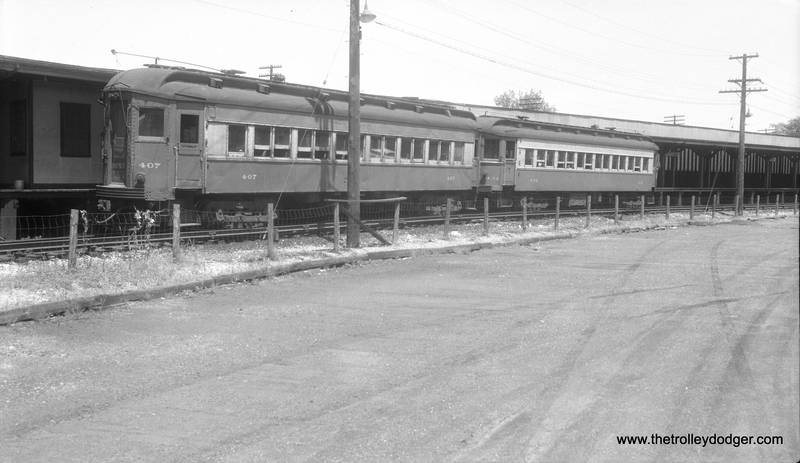 Chicago, Aurora & Elgin cars 407 and 432 at the Forest Park terminal in September 1955. CA&E service was cut back to here two years earlier. 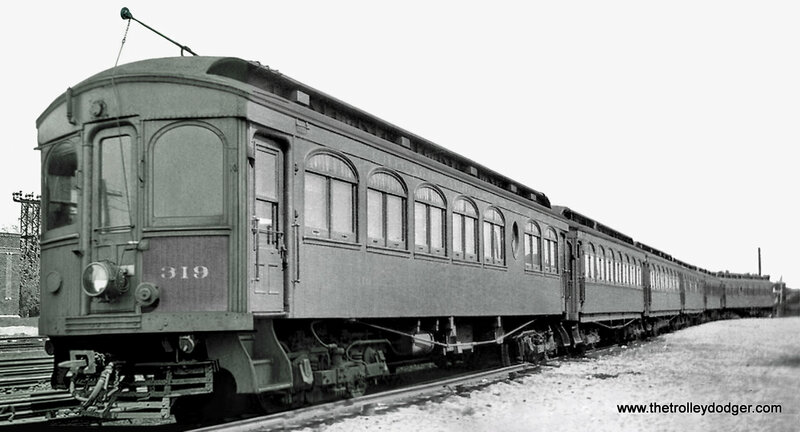 407 was a Pullman, built in 1923, while 432 was a 1927 product of the Cincinnati Car Company. Riders could change here “cross platform” for CTA Garfield Park “L” trains. 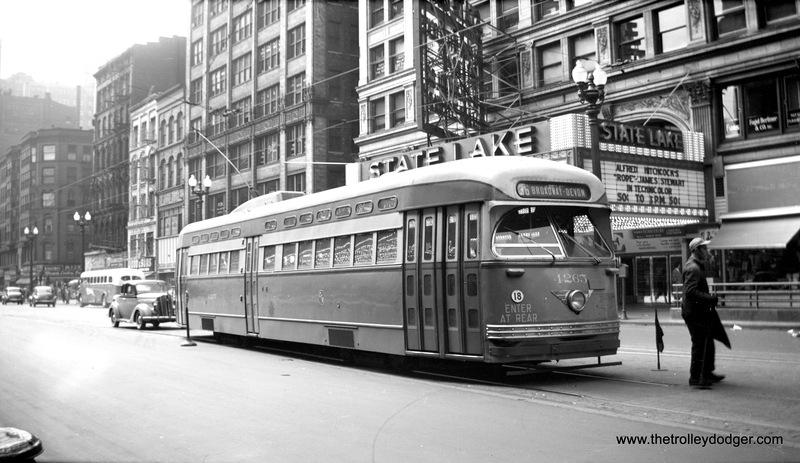 CTA PCC 4265, a Pullman product, heads north on State at Lake circa 1948, while Alfred Hitchcock’s film Rope plays at the State-Lake Theater. This has since been converted into production facilities for WLS-TV. 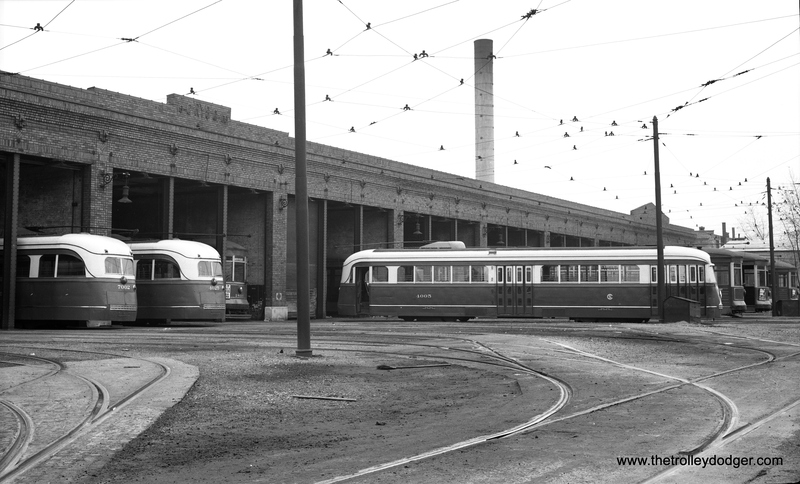 Here is a nice side view of CSL 4005 at Kedzie Station (car barn). At this time, the 83 Prewar PCCs were assigned to Route 20 – Madison. 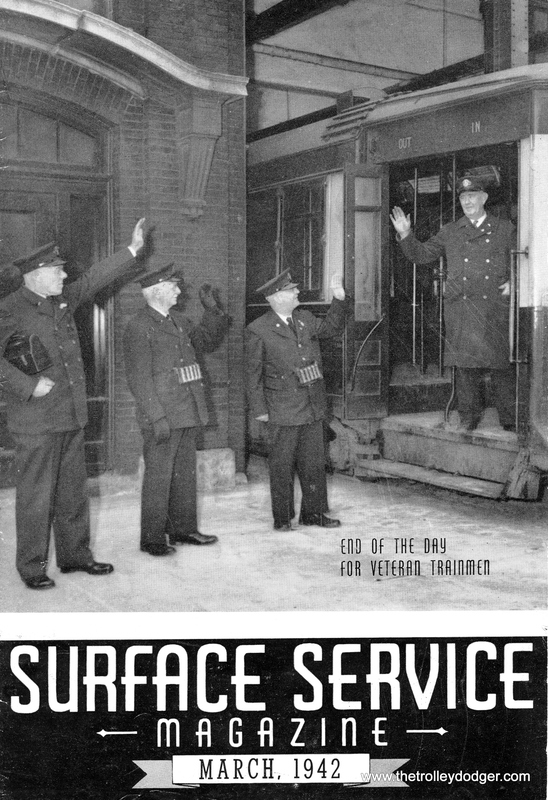 Faced with a manpower shortage during World War II, some transit lines hired female operators (although the Chicago Surface Lines did not). 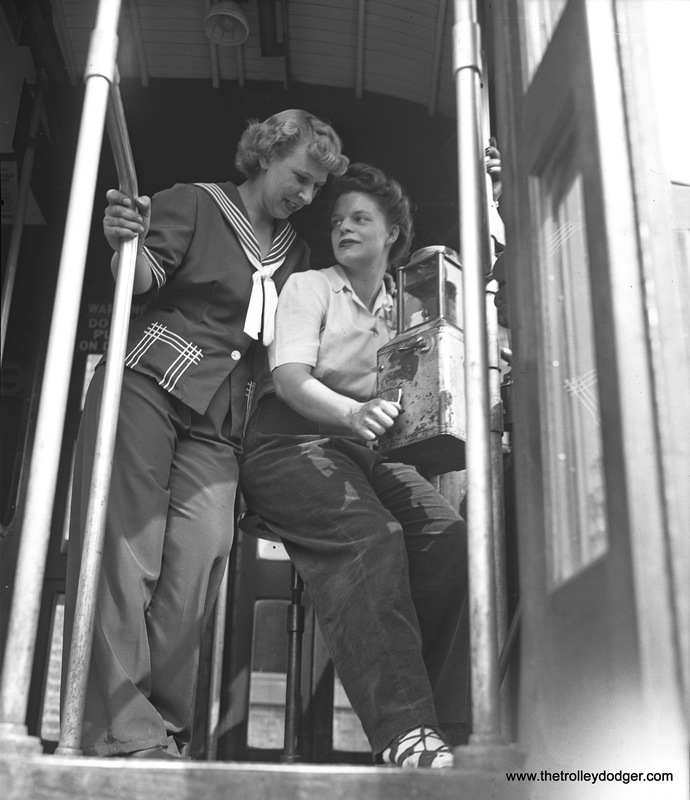 Here, we see Mrs. Cleo Rigby (left) and Mrs. Katherine Tuttle training in North Chicago on June 25, 1943. 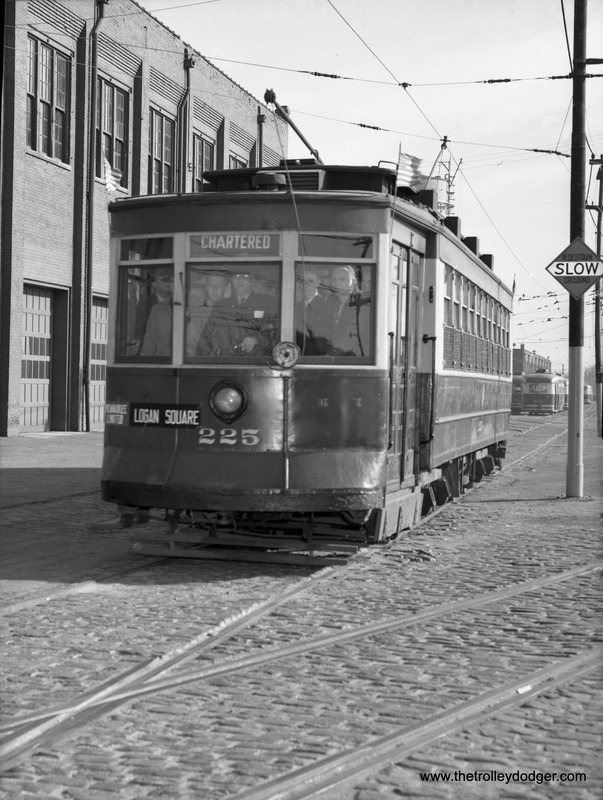 That would be for the North Shore Line’s city streetcar operations, which were mainly in Waukegan. A northbound two-car Evanston shuttle train is held up momentarily at Howard in the 1950s, as track work is going on up ahead. The rear car is 1766. 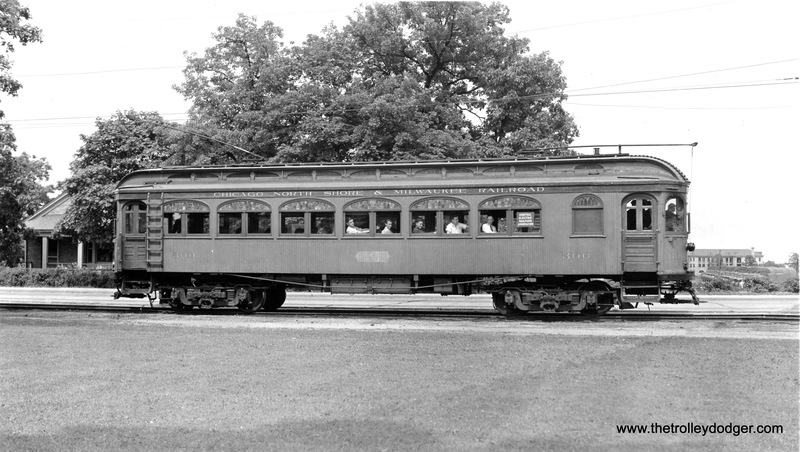 Don’s Rail Photos says, “1756 thru 1768 were built by Jewett Car in 1903 as Northwestern Elevated Railway 756 thru 768. 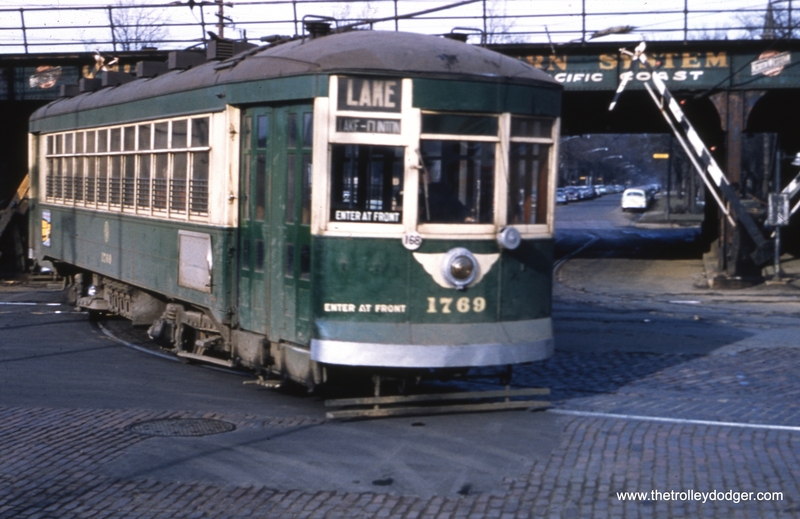 They were renumbered 1756 thru 1768 in 1913 and became CRT 1756 thru 1768 in 1923.” Wood cars last ran on Evanston in 1957. Notice that the station is also being painted. CTA postwar PCC 4404 is heading south, turning from Archer onto Wentworth on June 20, 1958, the last full day of streetcar service in Chicago. 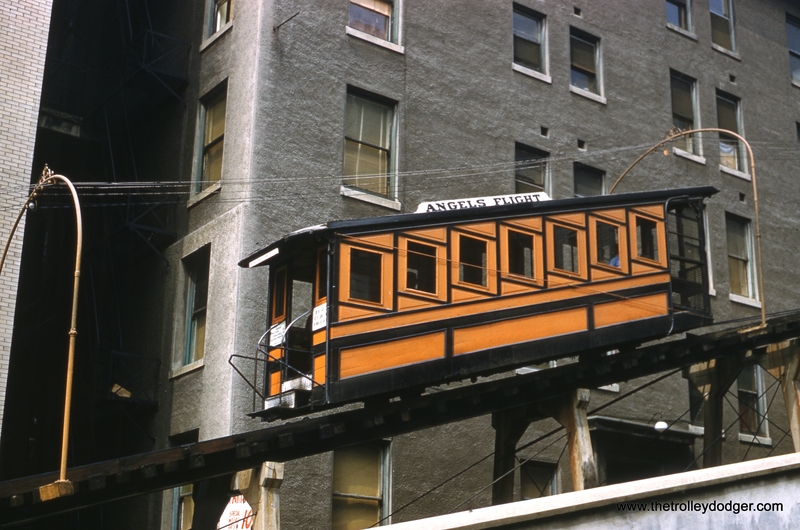 This was the last photo of a Chicago streetcar taken by the late Bob Selle. A close-up of the previous photo shows some evidence of Bondo-type patch work on 4404. 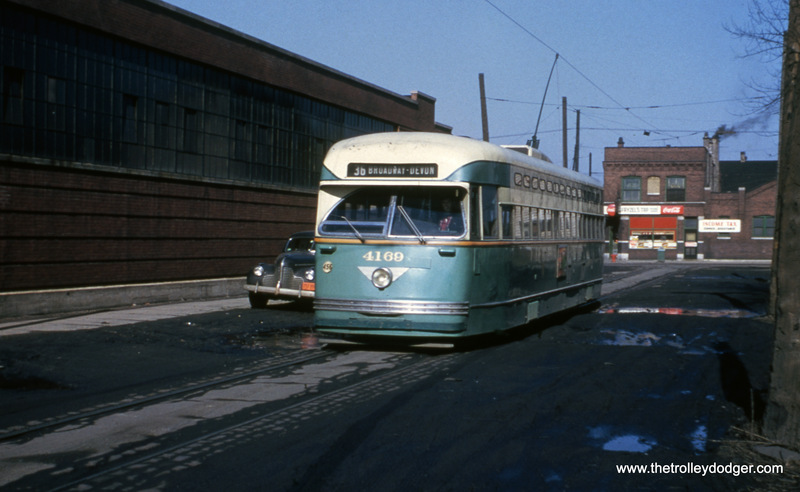 CTA Red Pullman 445 is on Route 21 – Cermak circa 1950. Behind it, you see the Lakeside Diner and Boulevard Buick, the latter located at 230 E. Cermak. Today, this is near the location of McCormick Place. CTA Red Pullman 104 is at Cermak and Prairie, east end of Route 21. This was just a few blocks away from Kodak’s Prairie Avenue processing plant, located at 1712 S. Prairie Avenue. 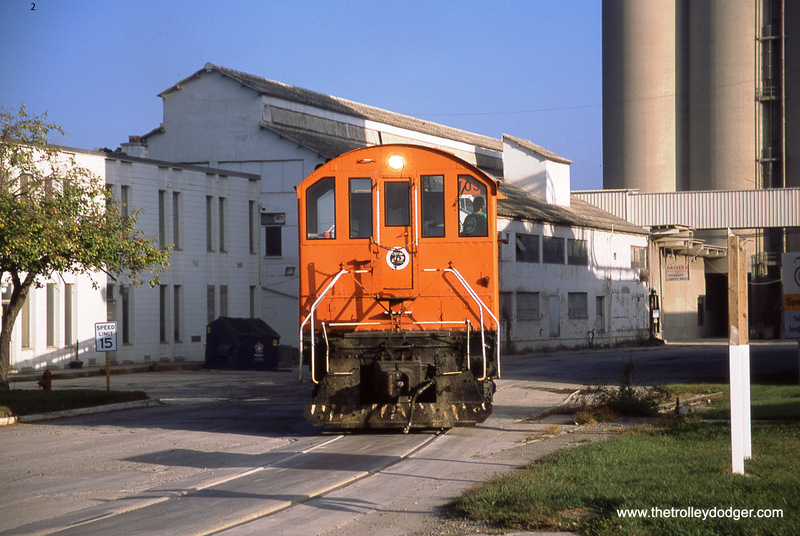 Many a railfan’s Kodachrome slides were developed and mounted there, until the facility closed in the mid-1980s. You can read more about it here. The landmark R.R. Donnelley and Sons Co. Calumet Plant, also known as the Lakeside Plant, is at rear. The plant closed in 1993, after Sears discontinued their catalog, and the building is now used as a data center. CSL “Big” Pullman 183 is eastbound on Roosevelt at Ashland on January 15, 1937, while 5502, an Ashland car, is turning west onto Roosevelt to jog over to Paulina. That’s Immanuel Lutheran Church in the background. 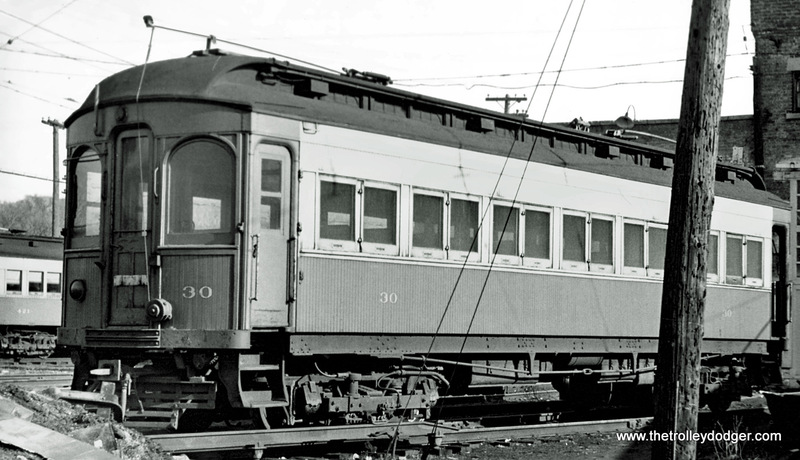 North Shore Line wood car 300, during its time as the Central Electric Railfans’ Association club car, probably circa 1939-40. 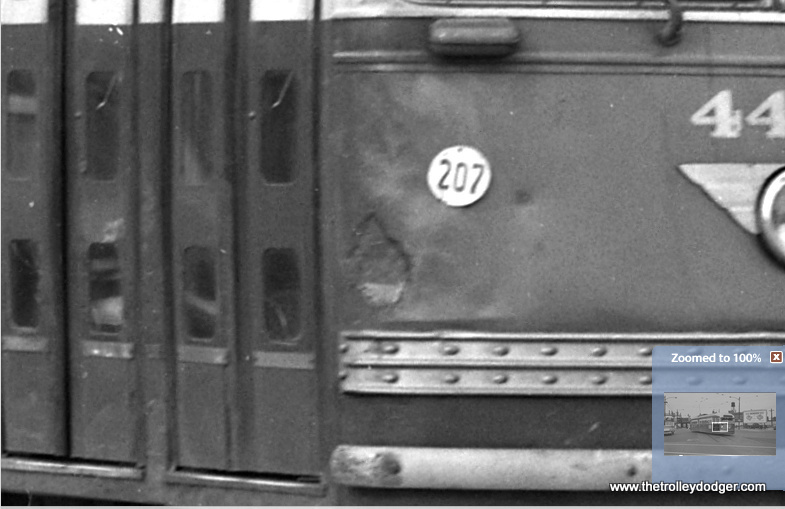 Perhaps someone can help us identify the location of car 300, somewhere along the Shore Line Route. Hi Dave, here’s a few more of my CA&E images. All of these shots were cleaned up with Photoshop. PS: The Julie Johnson collection website is back on line as of this morning (March 2). Great collection and I’m in it all the time. 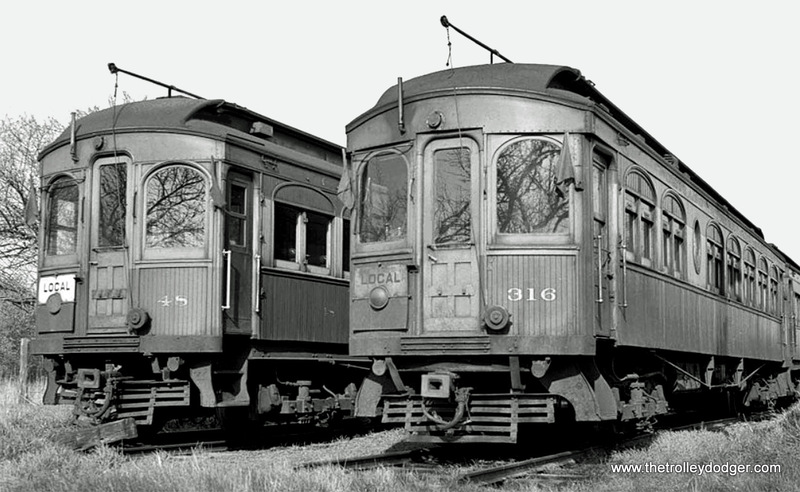 Here’s a head-on shot of CA&E cars 48 (Stephenson 1902) & 316 (Jewett 1913). 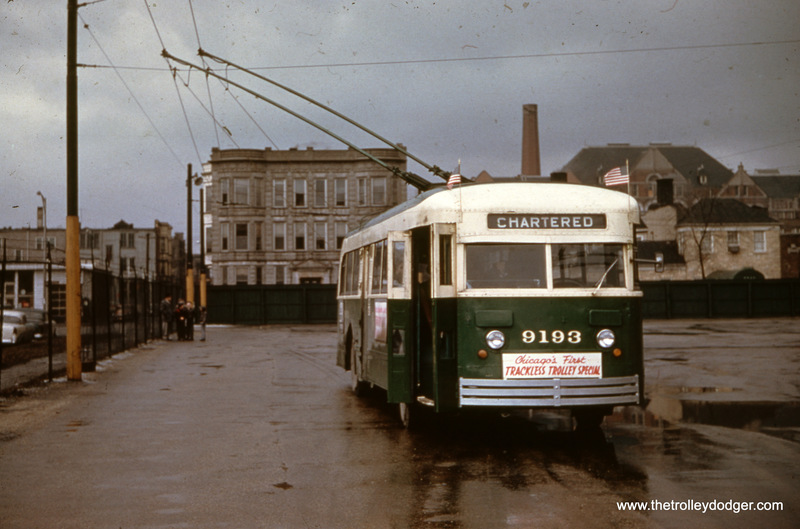 CA&E 30, my shot near the shops circa 1955. 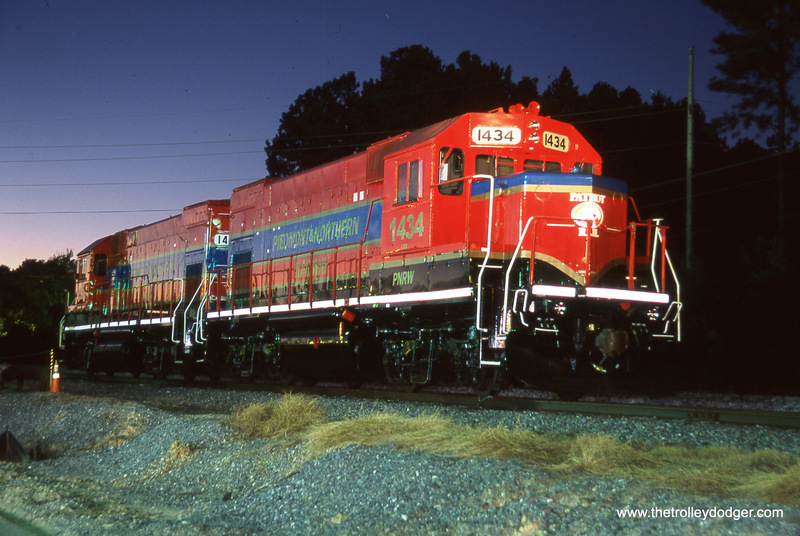 CA&E 18 looking good in this shot. 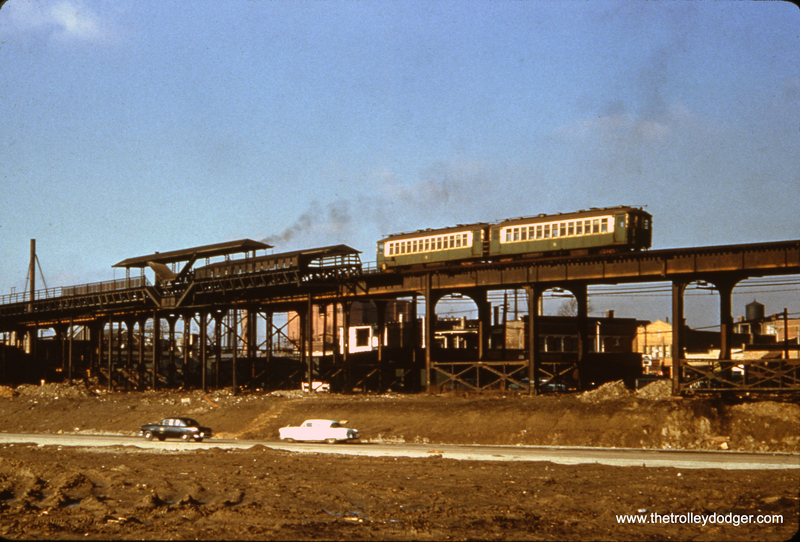 A train of the first cars with just the top of the old dispatcher tower in the background. Here is an image of the old tower, just about the only one from this angle. This is my shot of the new Dispatchers tower, circa 1955. Here’s one more that I think you’ll like. It looks like CA&E 310 (Hicks 1908) just came out of the paint shop, and boy did they do a nice job! One more for you that I completed this morning. It’s CA&E 319 (Jewett 1914) heading a line of cars. I got the original from Hicks Car Works, which is the JJ collection. It was a really bad picture and it took about 4 hours to complete. I just recently discovered your blog and really enjoy it. First of all, I do not know much regarding Chicago traction, but have always been a fan. I love the city, I loved the interurbans (I was fortunate to have ridden all three of the big ones) and I even love the buses. I have made a small purchase of your books and videos and plan to buy more as my finances allow. Second, I like the way those who know things seem to be willing to share their knowledge. I firmly believe that knowledge is something to be shared, not hidden. Third, I like that the photos on the blog are of a sufficient resolution that they can actually be seen and enjoyed. Anyway, if I know anything appropriate, I will pitch in. Great, thanks! Glad you like the site. I am looking for a photographer named C. Scholes to return some photo prints. We posted a 1952 photo by a C. R. Scholes in One Good Turn (January 20, 2017). That’s all the information we have. Perhaps one of our readers can help further, thanks. 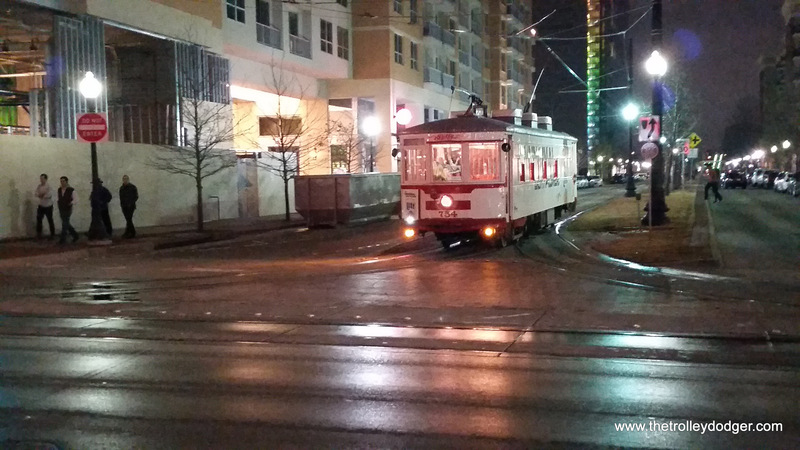 Here are some shots of “Betty” making the rounds in Uptown, Dallas for you. 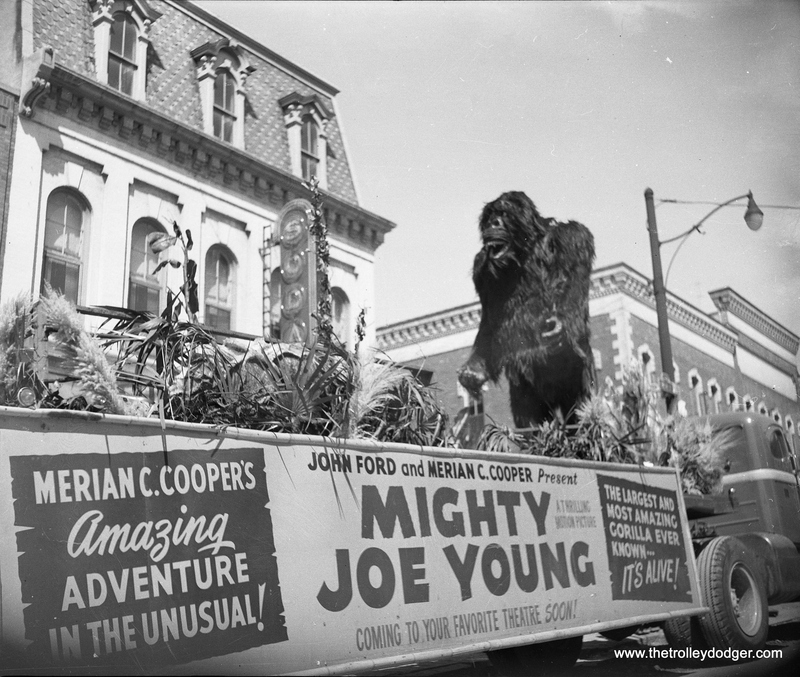 While this isn’t transit related, I figured our readers might enjoy seeing these pictures, which show a publicity float for the 1949 film Mighty Joe Young. 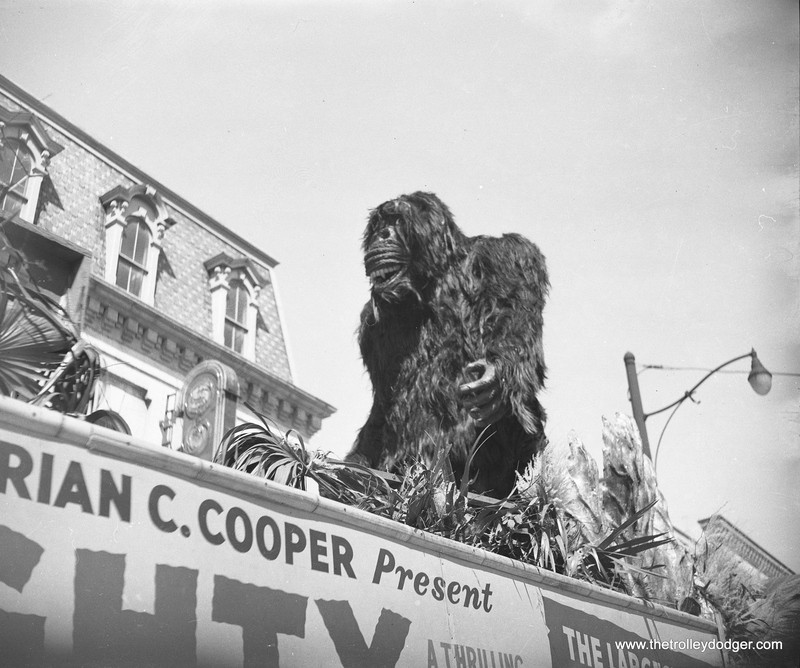 This was a sort-of remake of King Kong, which reunited much of the same creative team involved with the 1933 original, including Merian C. Cooper, Ernest B. Schoedsack, Robert Armstrong. Ruth Rose, Marcel Delgado, and Willis O’Brien. 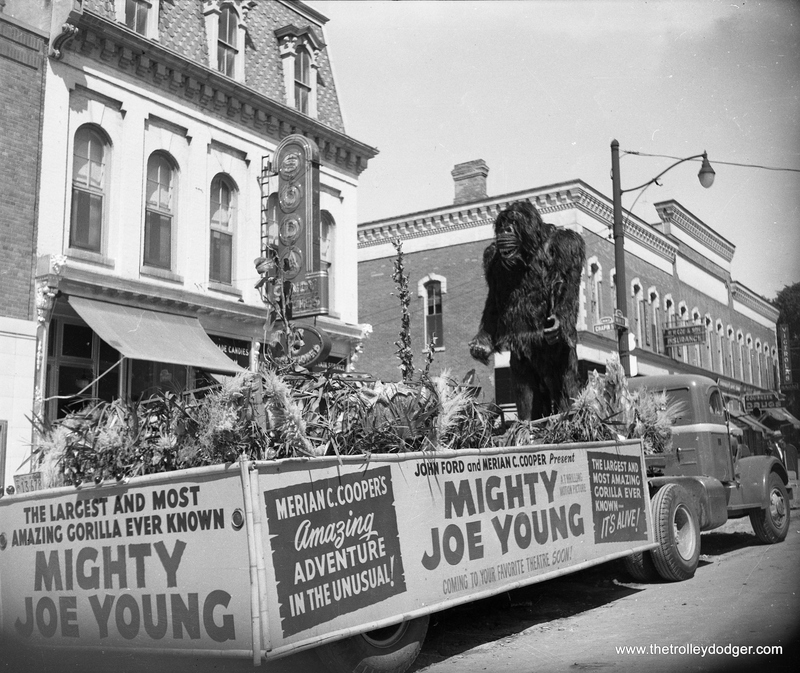 If anyone knows where this parade may have taken place, please let me know. 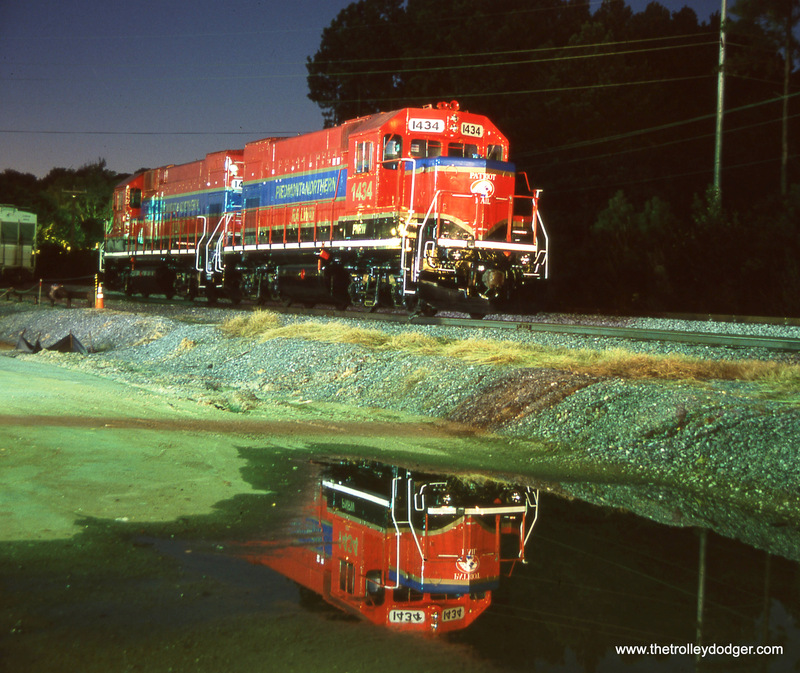 This is our 177th post, and we are gradually creating a body of work and an online resource for the benefit of all railfans, everywhere. To date, we have received over 259,000 page views, for which we are very grateful.